This is a picture to remember! 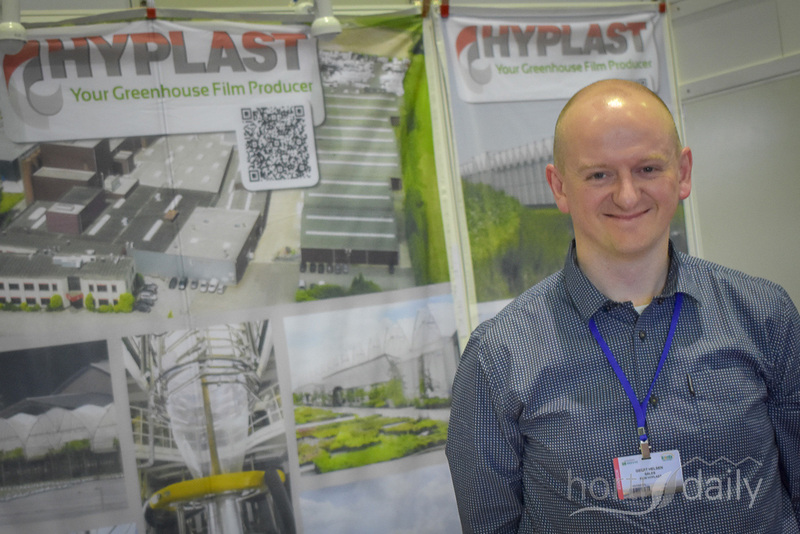 This was the last time Peter Sallaets is photographed with the Greenyard Horticulture logo. This week the company's new name will be announced. 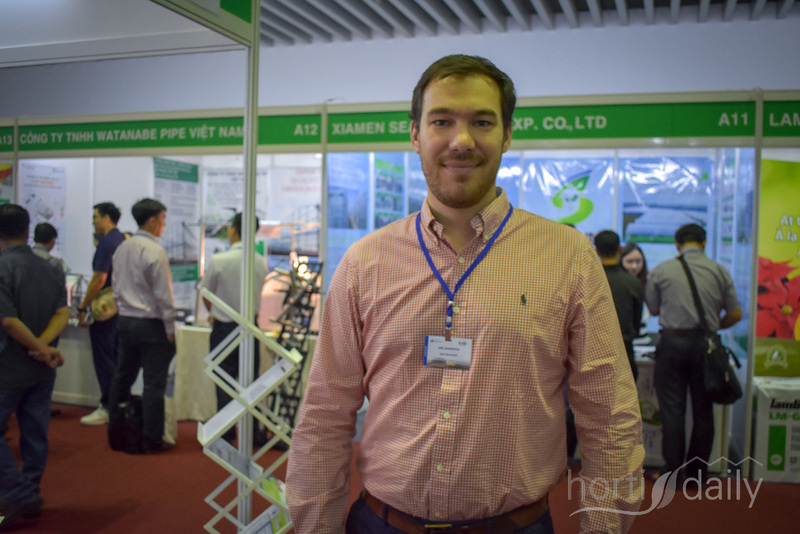 Simon Jones with Genap participated with the team of Trinog xs & partners ATC. Left on the photo Chau with ATC. 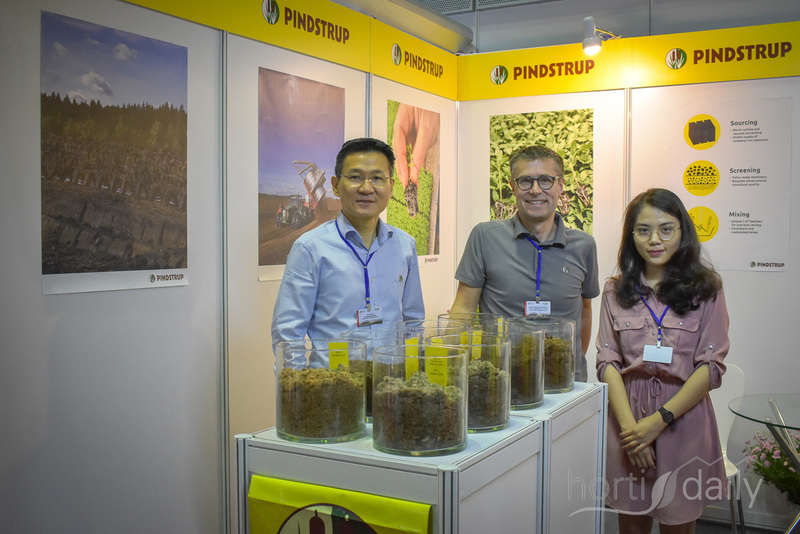 Lee Chye, Jens Jorgen & Hjor Tshoj with Pindstrup. 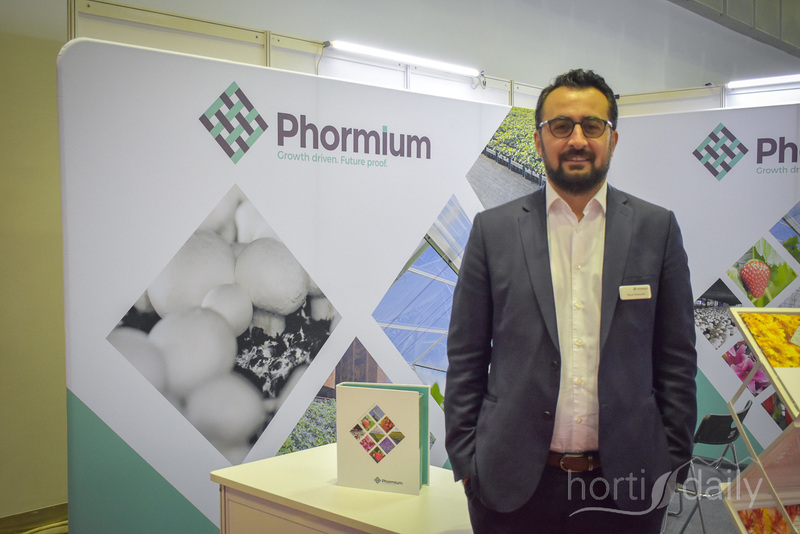 Tayyar Erzurumlu with Phormium travels all over to keep growers in Middle East, East Africa & Asia updated on the benefits of screens. 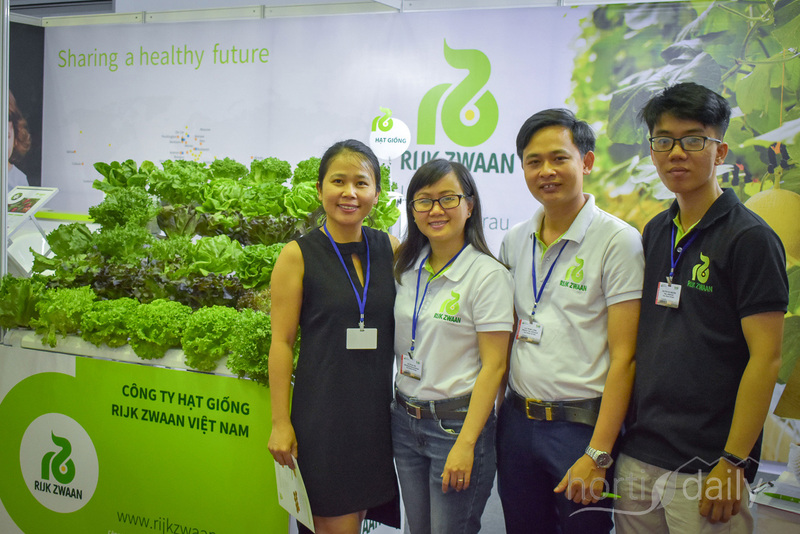 Last year Rijk Zwaan opened a subsidiary in Vietnam so the Rijk Zwaan team could not be missed. 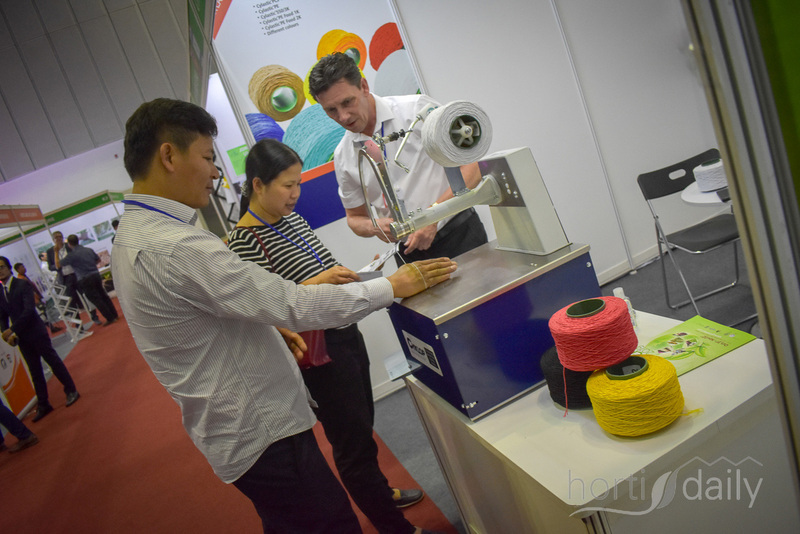 Peter de Boer, Cyklop, shows the famous Cyklop machine by binding all visitors. 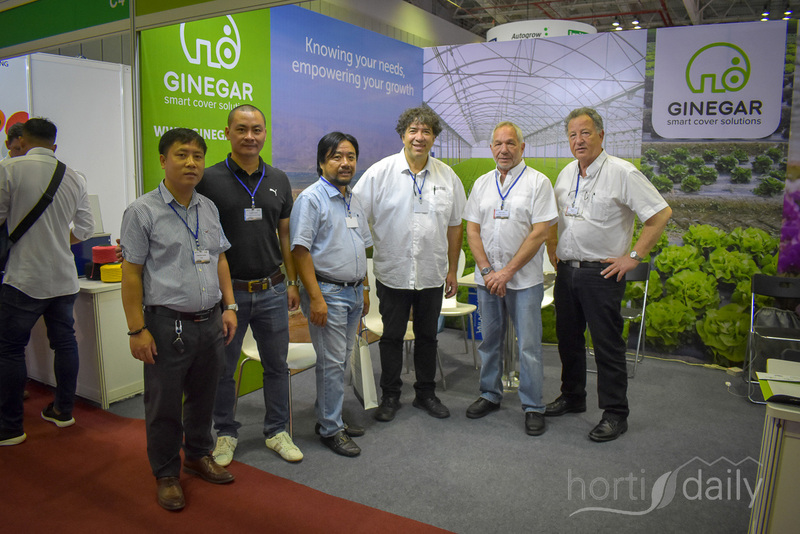 Arie Gemore, Moshe Ron & Omer Gutman with Ginegar Plastic Products are visited by Thuong Pham & Truong Vu. 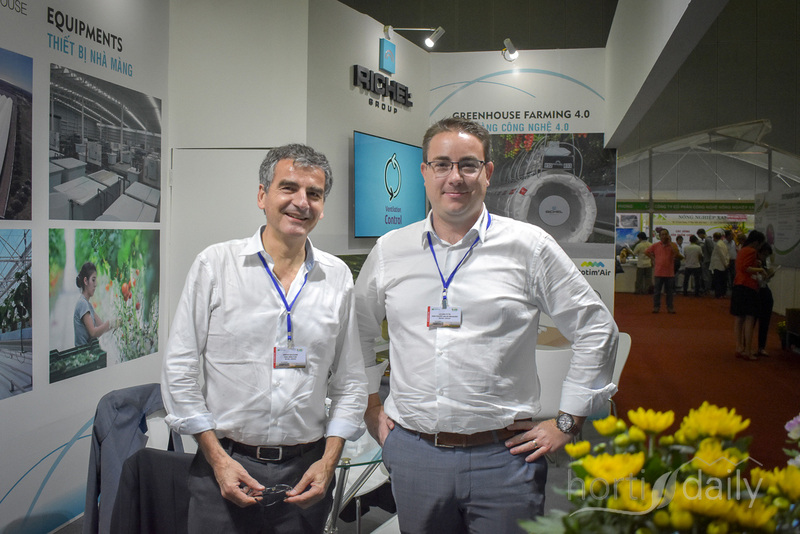 Eric Barneron with Gautier Semences. 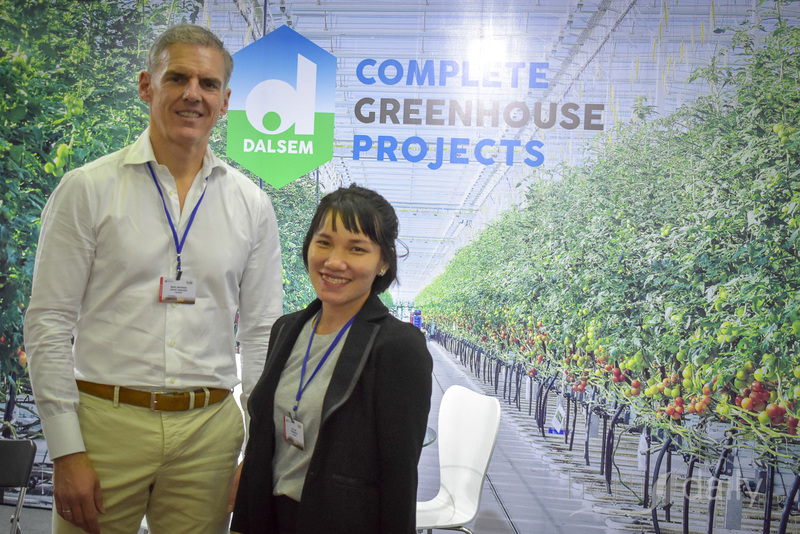 Marc Broeren with Dalsem Greenhouse Projects & the Vietnamese interpretator helping him out in the Vietnamese market. 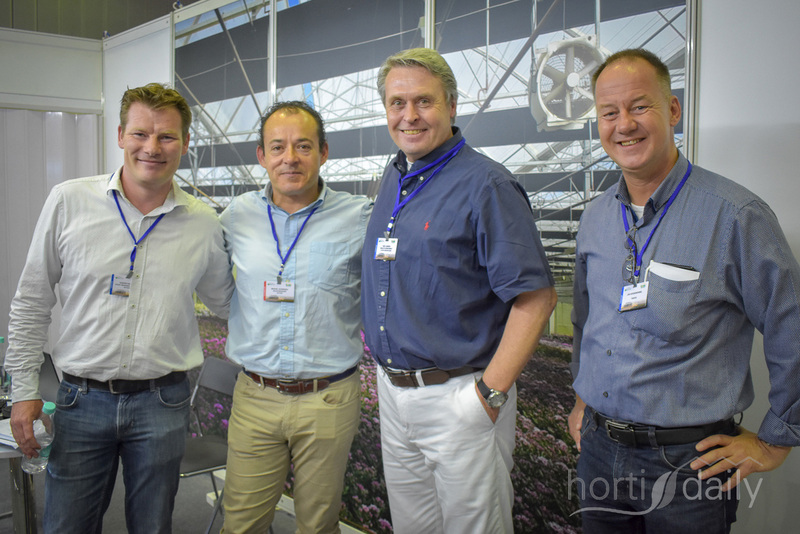 Kasper Rietvelt with Anthura, Manuel Guerrero (Asthor), Kick Jansen (Luiten Greenhouses) & Jan Hoogewoning, (Ridder). 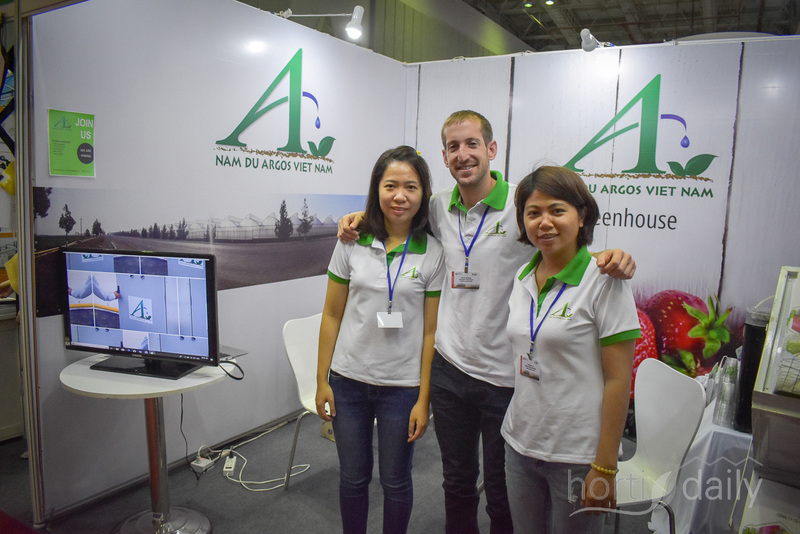 Ruud Schenkels with De Giervisits NHA Nguyen: Huong Nguyen & Son Nguyen. 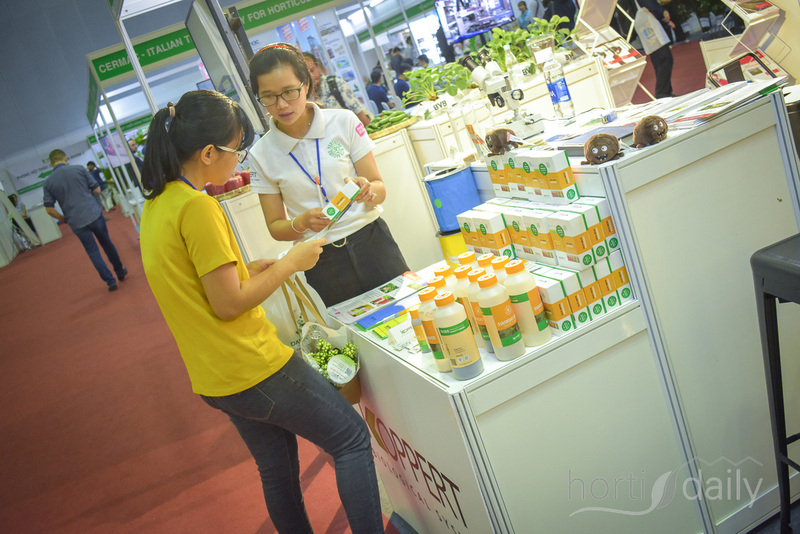 Explanation about the Koppert products. Italy represented! Alessandro Mazzacano with Urbinati, Gianluca Grossi with Forigo & Riccardo Preti with Ferrari. 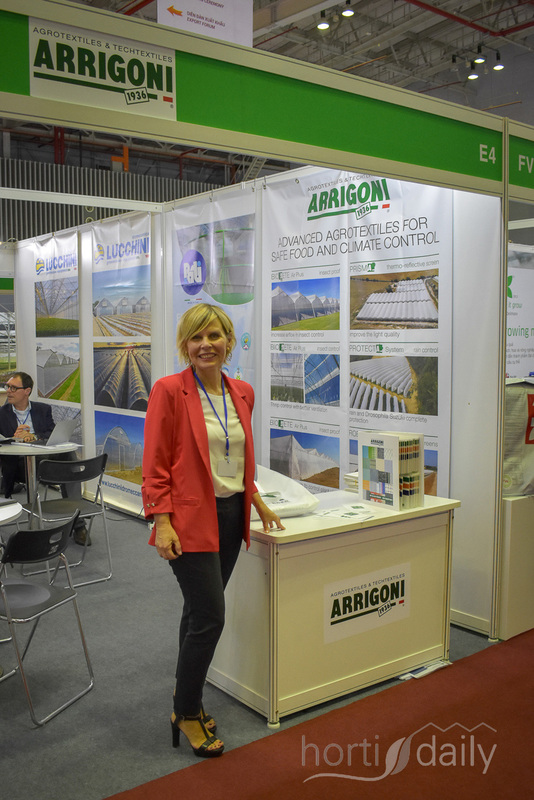 The team with Azrom provides turnkey solutions to growers in various climates. 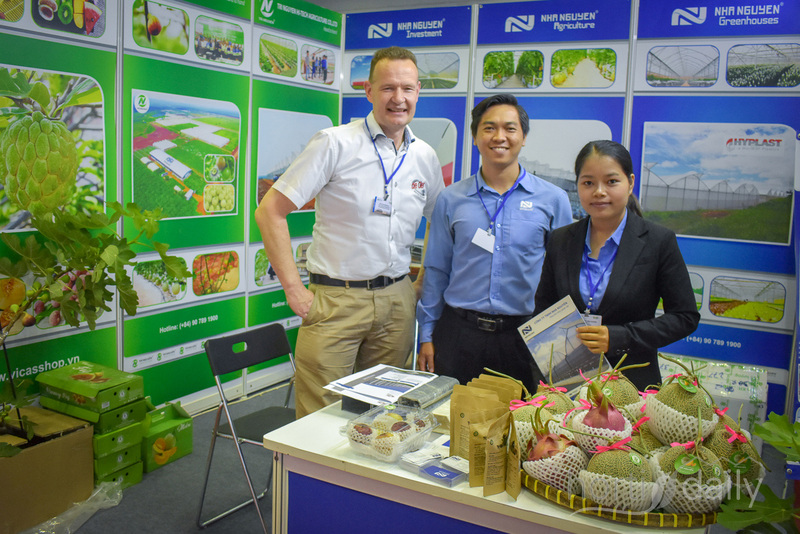 The team with CMF presented its greenhouses unitedly with the Vietnamese growers of O Xanh Farm. 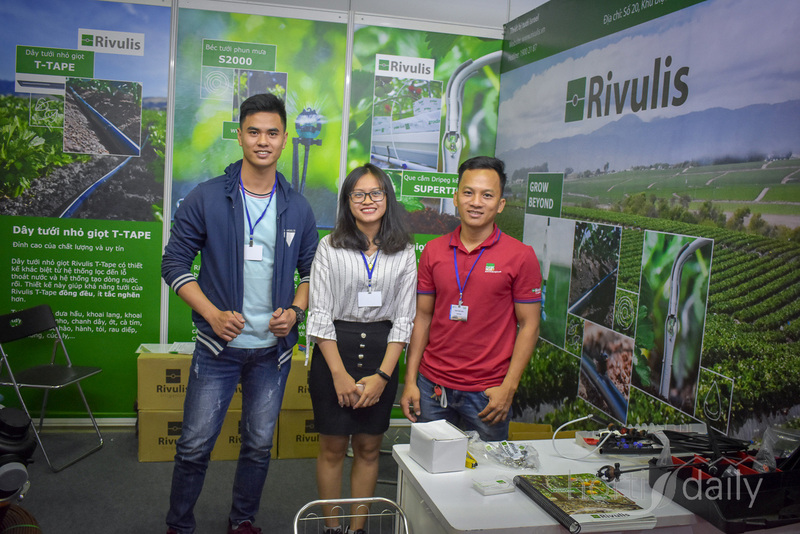 Drog Ravitz & the team from Tuff Substrates. 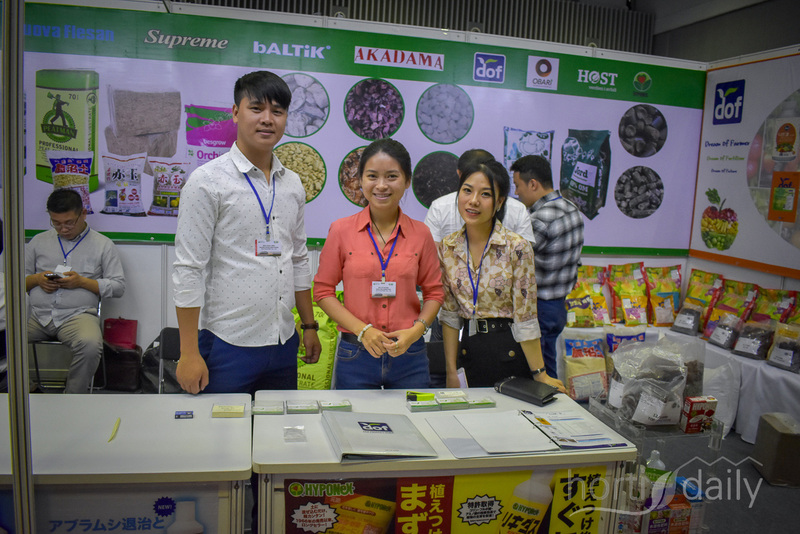 Itt Chotikapanich & Rangsirat Chotikapanich with Vis & Son, manufacturer and marketer of PE film and sheet in Thailand. 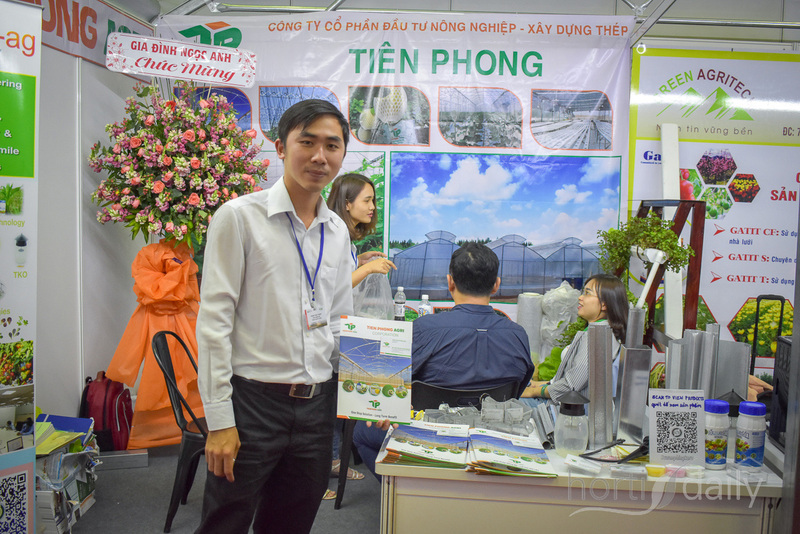 The Vietnamese company Kuji Greenhouse designs, builds and installes foil greenhouses in Vietnam. 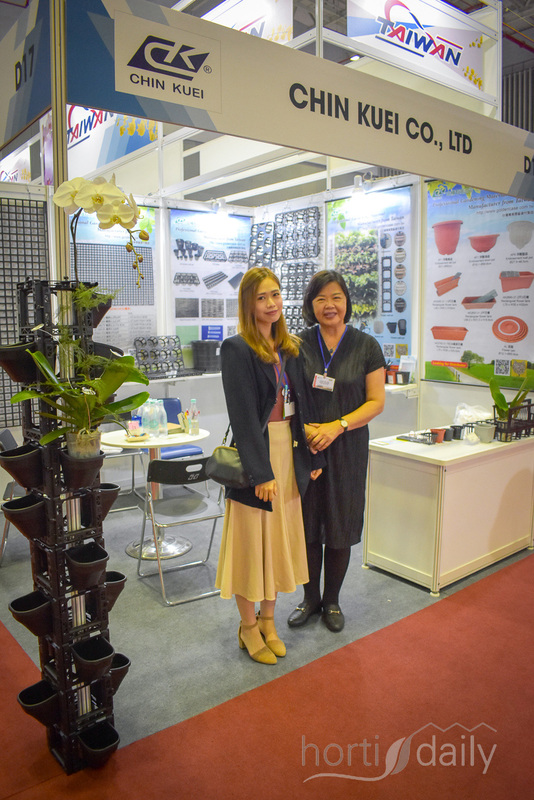 From Taiwan are the lovely Jasmine Huang & Ling Ling Chang with Chin Kuei Gardening Material, moulding injection company. 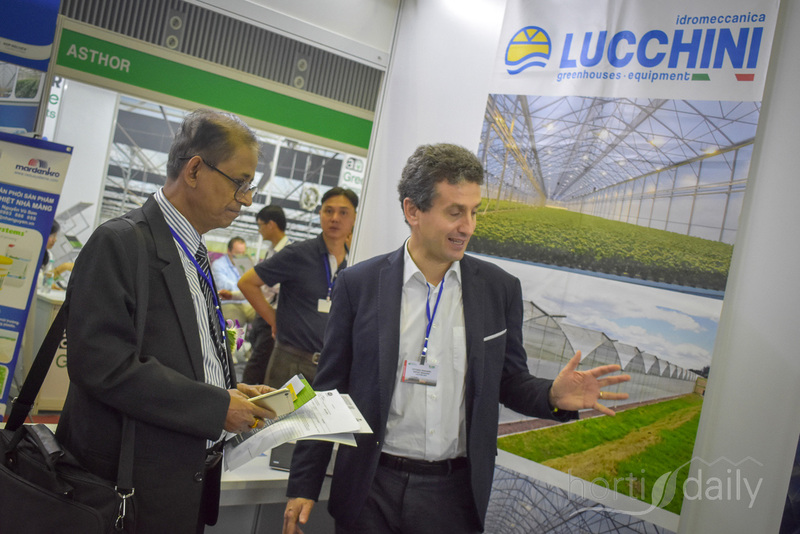 Tomas Thizy with Agripolyane, talks to the team of Jin Jhan Greenhouse project, a Taiwanese greenhouse supplier & builder. 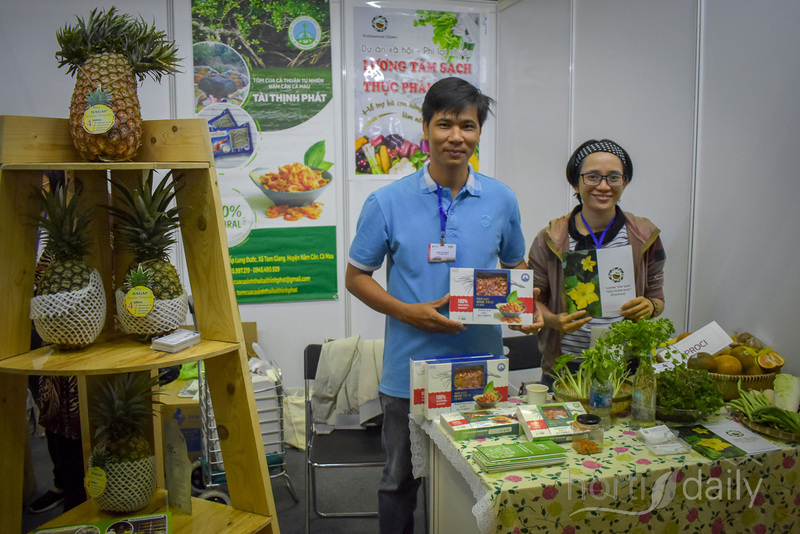 That's one happy Kuno Jacobs with Nova Exhbitions. 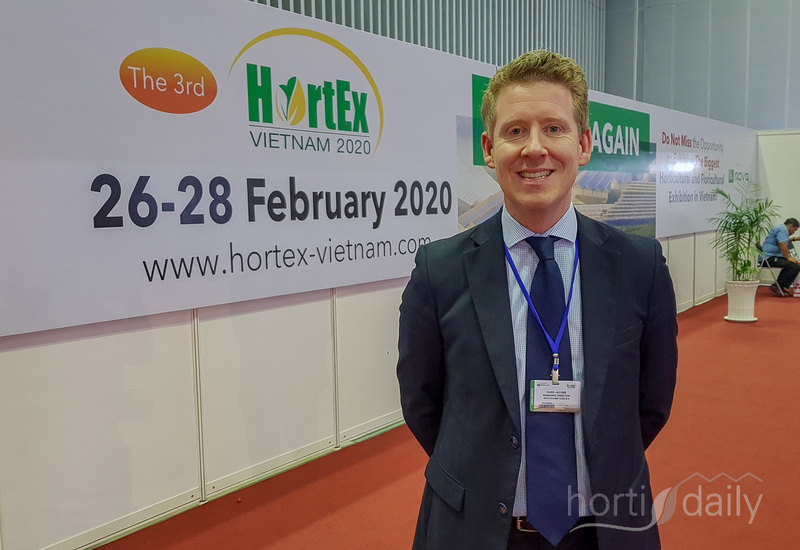 The show organiser rebooked a steady amount of stands for next years HortEx Vietnam, which will take place from February 26th - 28th 2020. 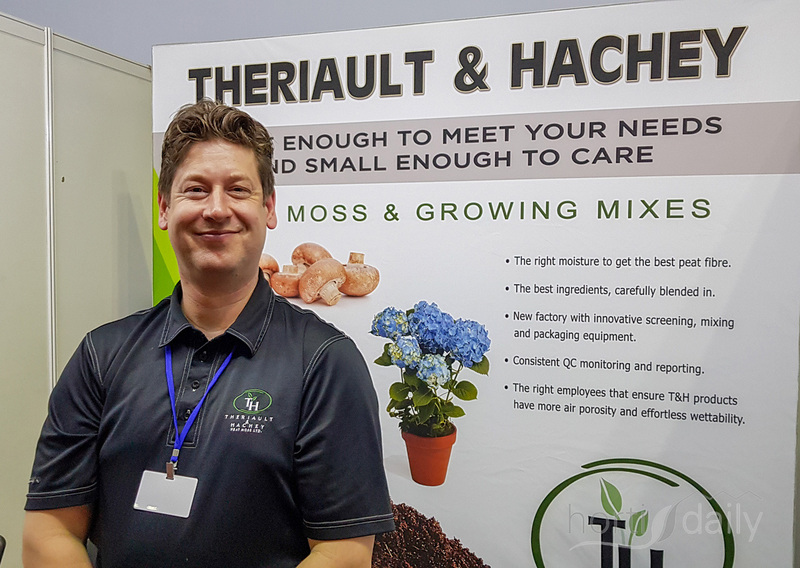 Jody Williston with Theriault & Hachey Peat Moss, offering the moss & growing mixes to help growers in Vietnam & surrounding countries. The floors filled up rapidly. 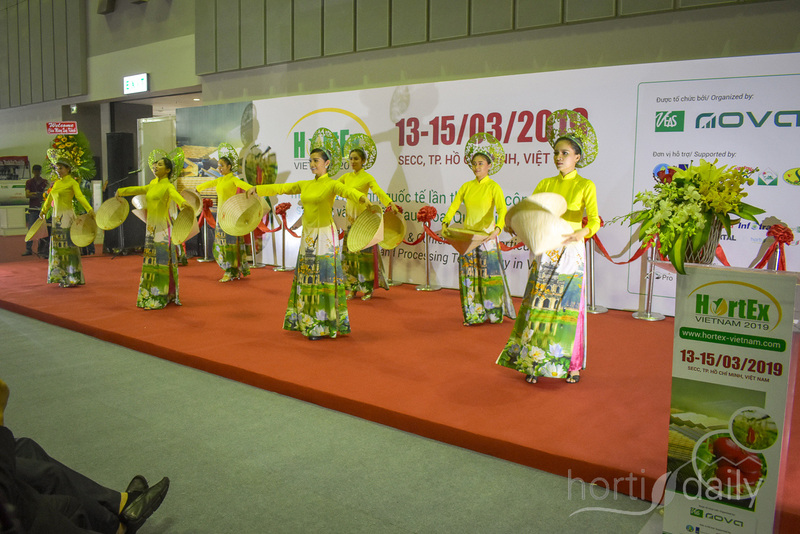 The event attracted 25% more visitors than last year. 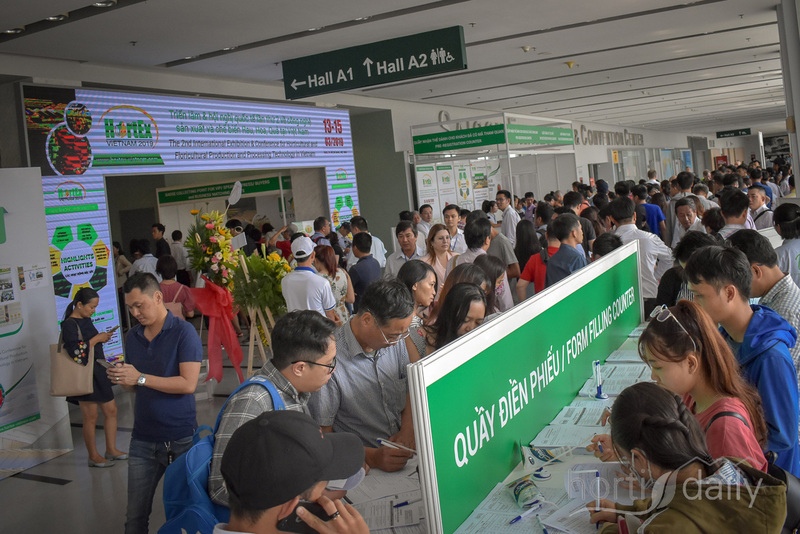 The seminars were visited by 100s of people. 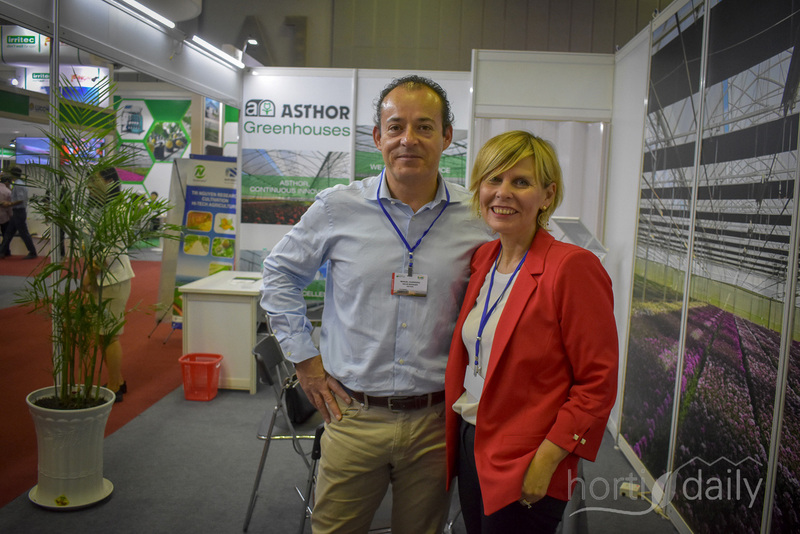 Manuel Guerrero Delgado with Asthor Agricola is visited by Patrizia Giuliana with Arrigoni. Thong, Michael Hwang & Cedric Faure with Klasmann Deilmann. 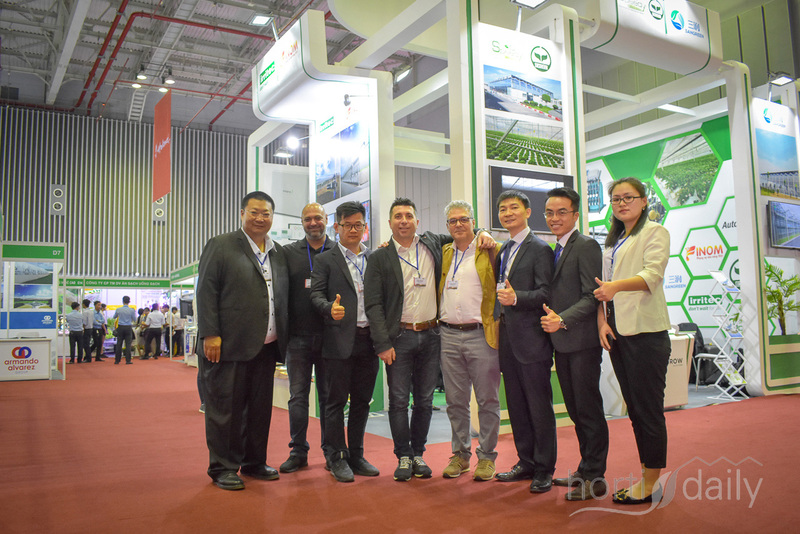 Together with the team of Phu Sa the team of Enza Zaden shared the latest developments on their range of greenhouse varieties, suitable for the Vietnamese market. 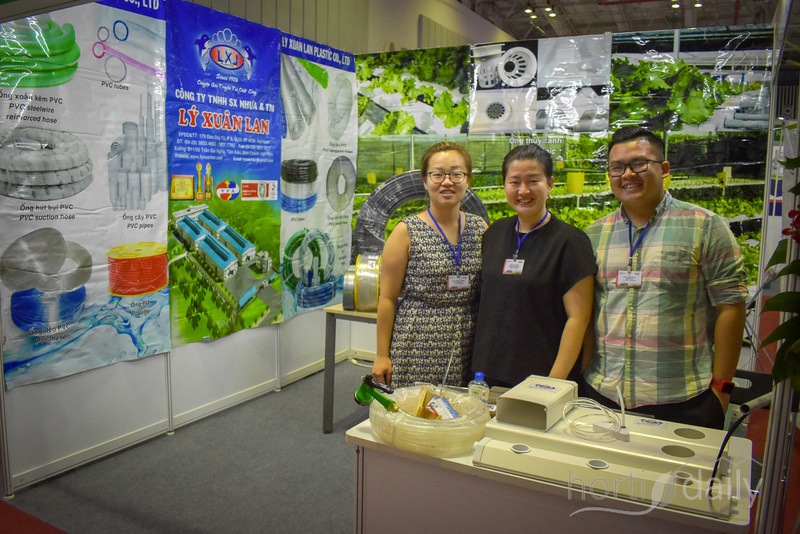 HSIA Cheng woven textile company, represented by Scott Tsai & Maggie Chen. 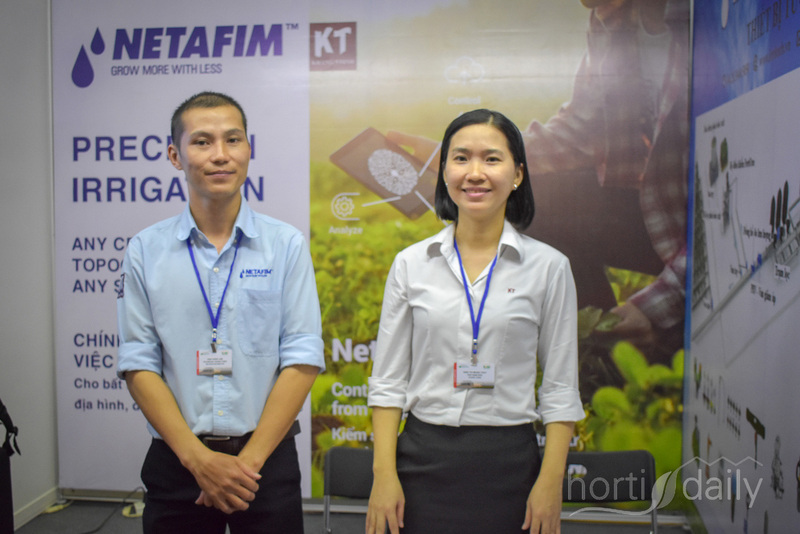 Lam Dinh Hong & Thuy Dinn Thi Mong with Netafim, providing irrigation solutions. 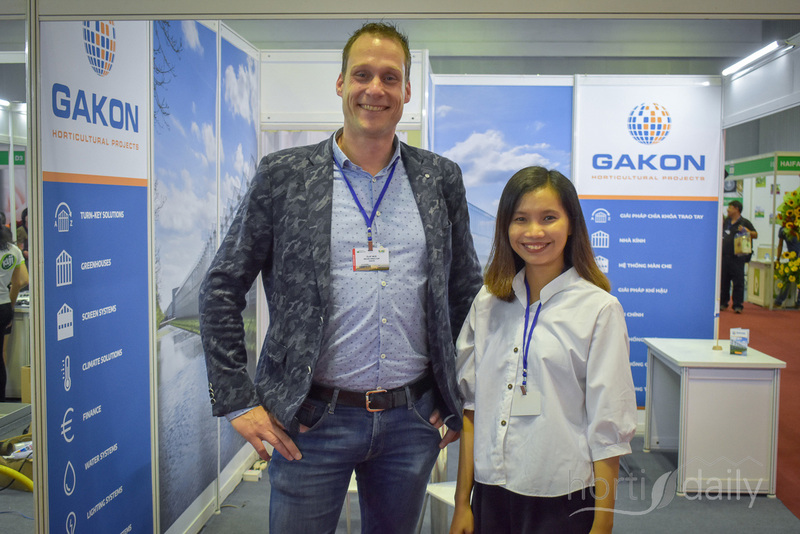 Olaf Mos with Gakon & interpreter Hong Thi Ho. 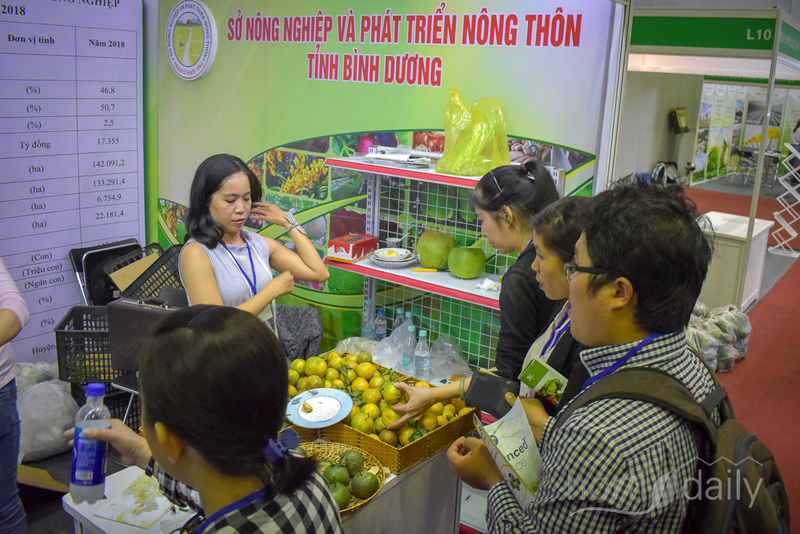 Nguyen Tam with Danny Green shows the company's melons. 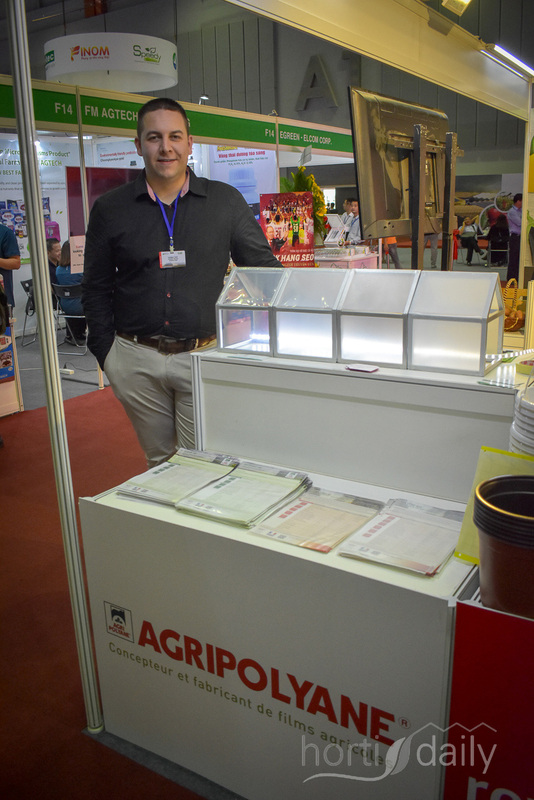 Pascual Miralles with Novagric welcomes visitors in his booth. 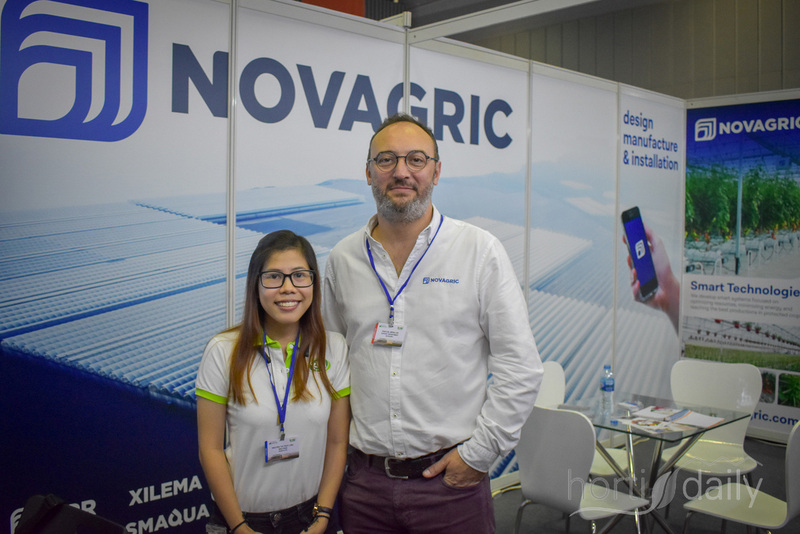 Novagric is the brand of Novedades Agricolas which has been launched because of the company 40th anniversary. 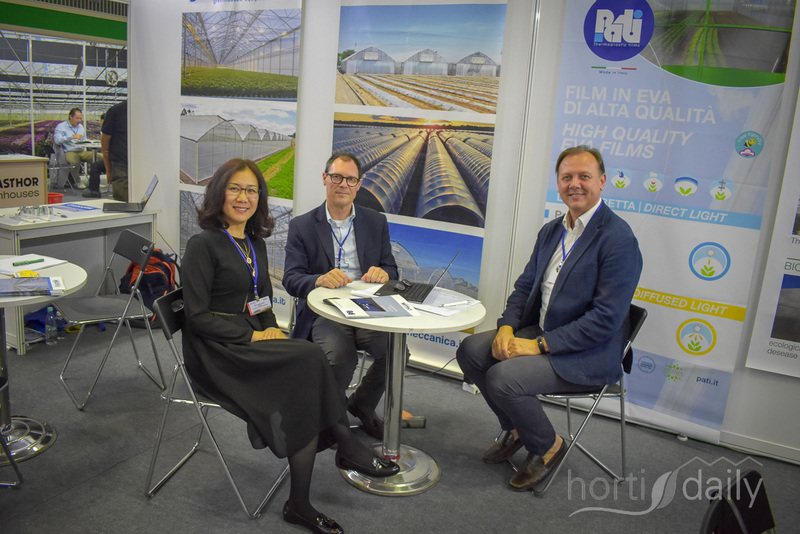 Internationally the company was also known as APR, which is the company’s brand of greenhouses. 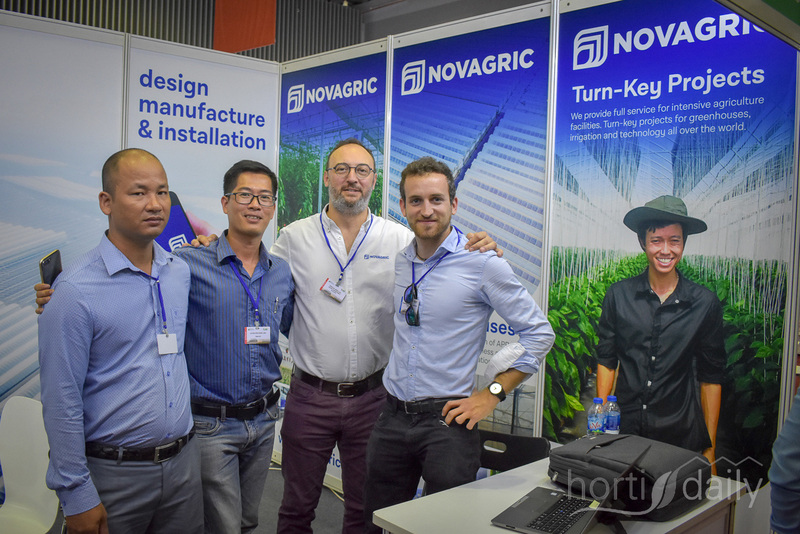 Pascual Miralles with Novagric & Hong, the Vietnamese translator joining for the exhibition. 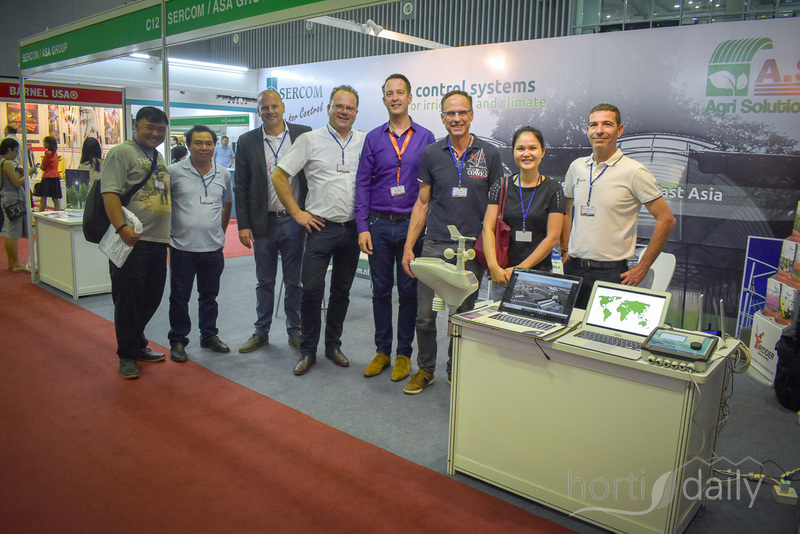 When it's about Southeast Asia and horticulture, Wim Damsteegt & Jeroen Baasare there, showing the Greenspan greenhouses. 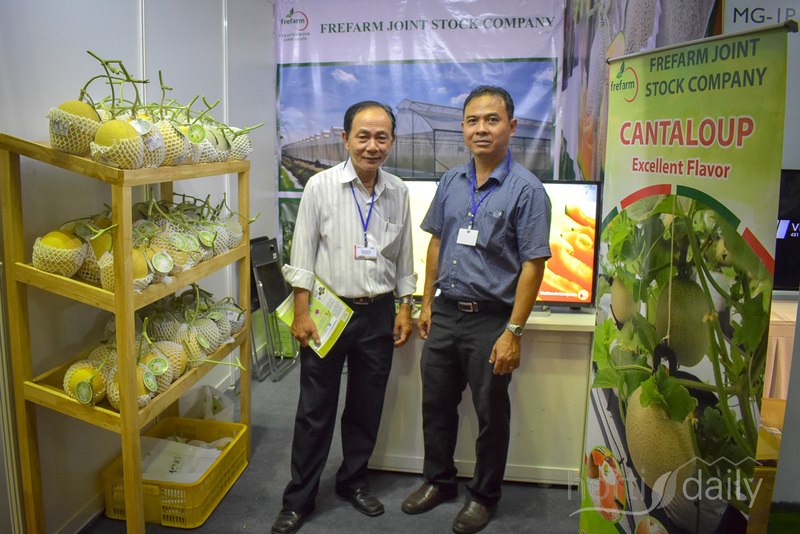 Tran van Nam & his colleague Bui Thai Hoa with Frefarm. 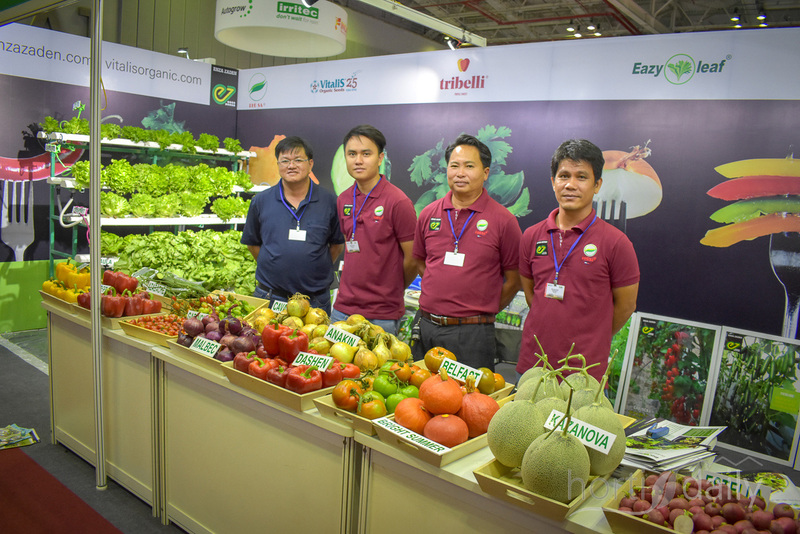 The company grows cantaloupe melons on a 70 ha+ farm with a 7 hectare greenhouse. 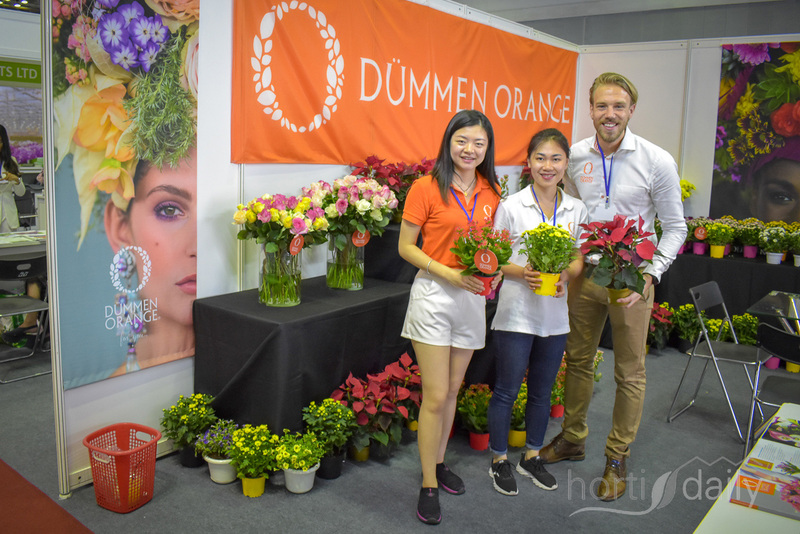 Dümmen Orange Asia joined for this years HortEx. 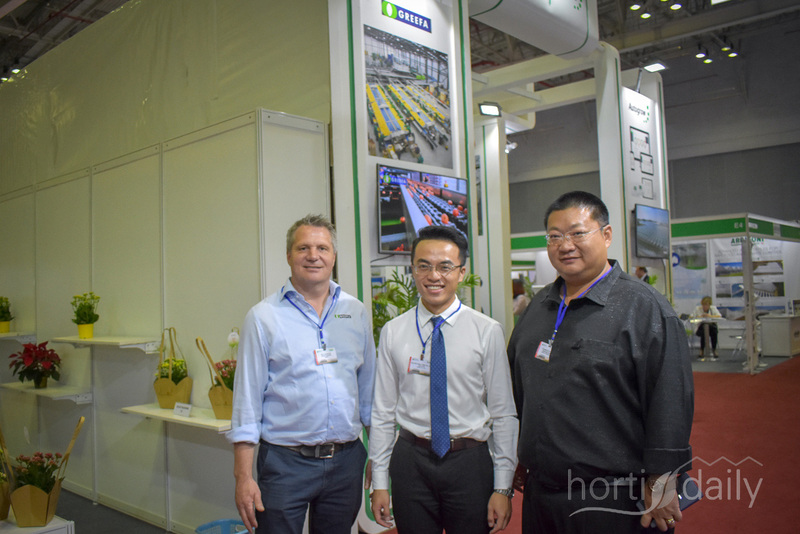 Here's the team with Jinwen Zhou, Hang Li & Jim Koop. 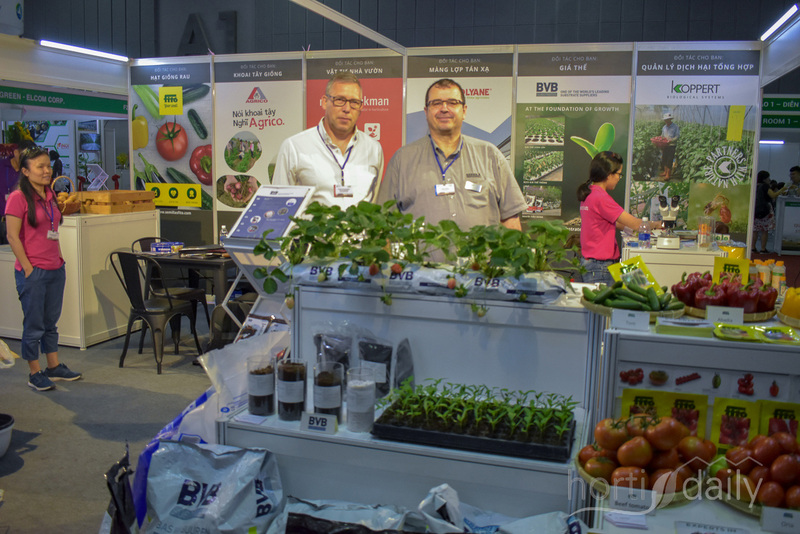 Johan van Gelderen with BVB Substrates & Peter Balint with Kekkila Professional joined at the booth of Fresh Studio. Vincent van der Wilk & Nanne Bentvelzen with Royal Brinkman. 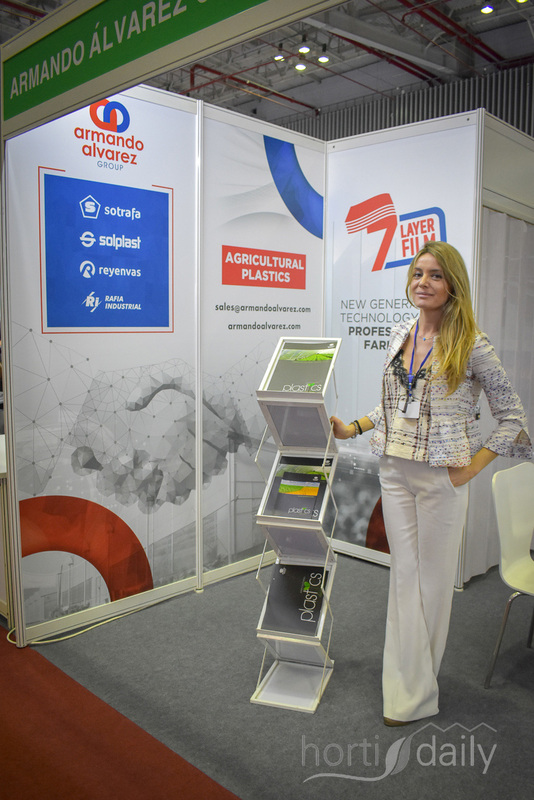 Tomas Thizy with Agripolyane, specialized in plastic film. 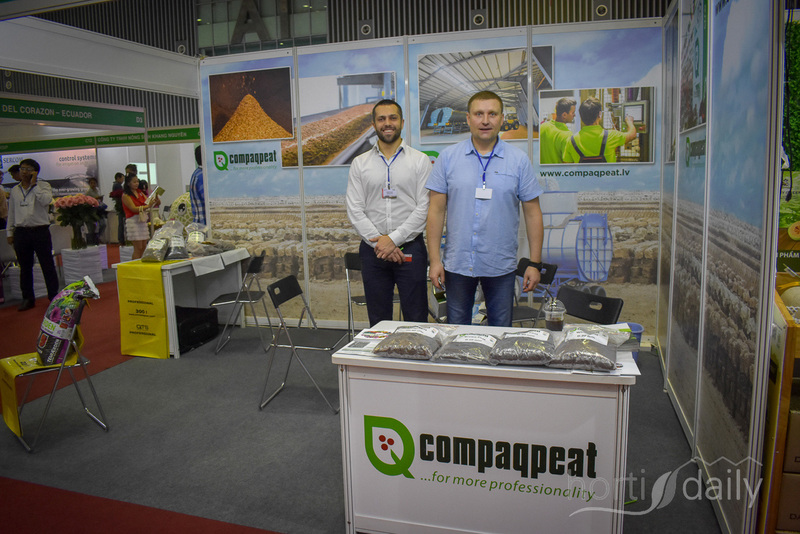 Mareks Kalve & Darius Karcmarinas with Compaqpeat. 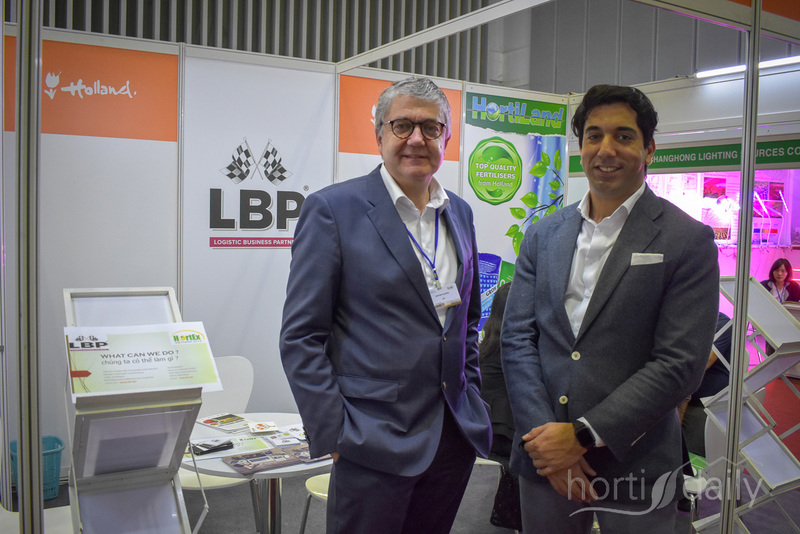 Anton Filippo with LBP (Logistics Business Partners) is joined by Manuel Madani of VNU Exhibitions. 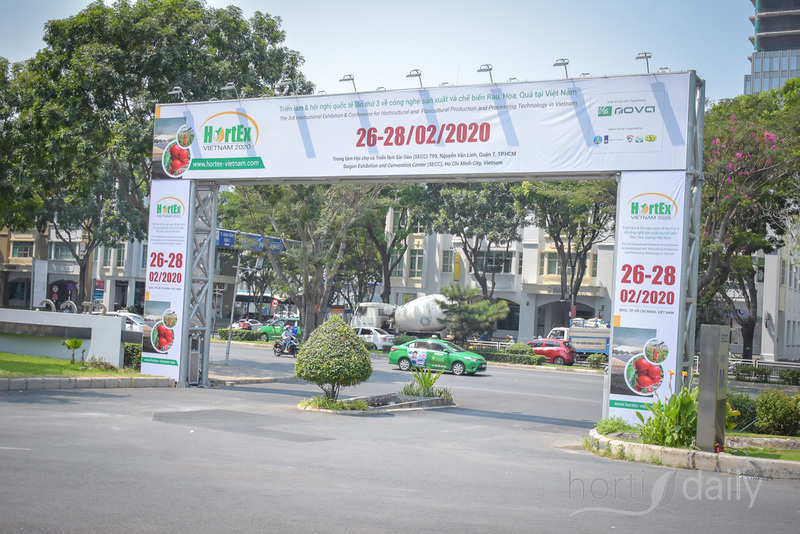 Start of the second day! 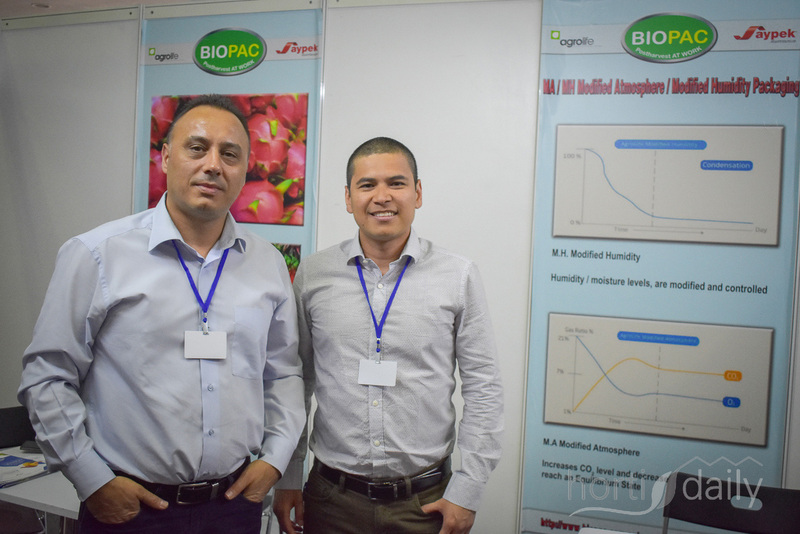 Levent Cakmak & Andres Rodriguez with Saypek / Biopac. 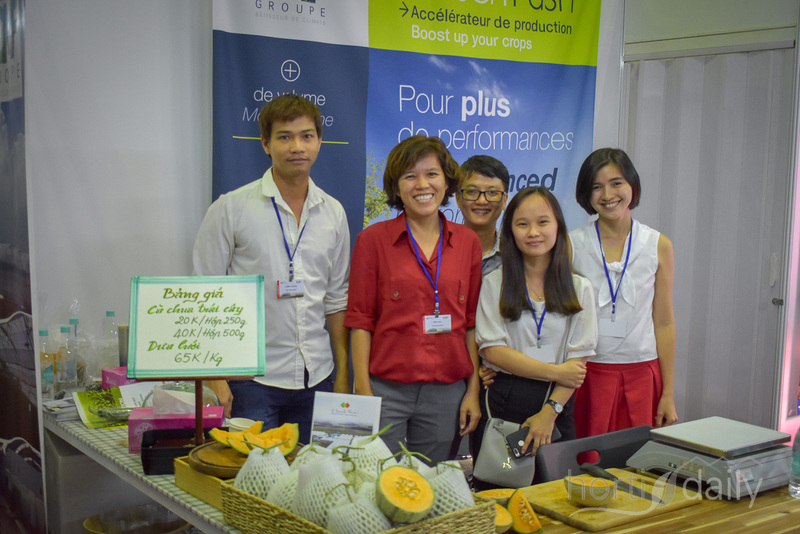 The ladies of Comptoir Paulinois, French breeder of flowers & bulbs. 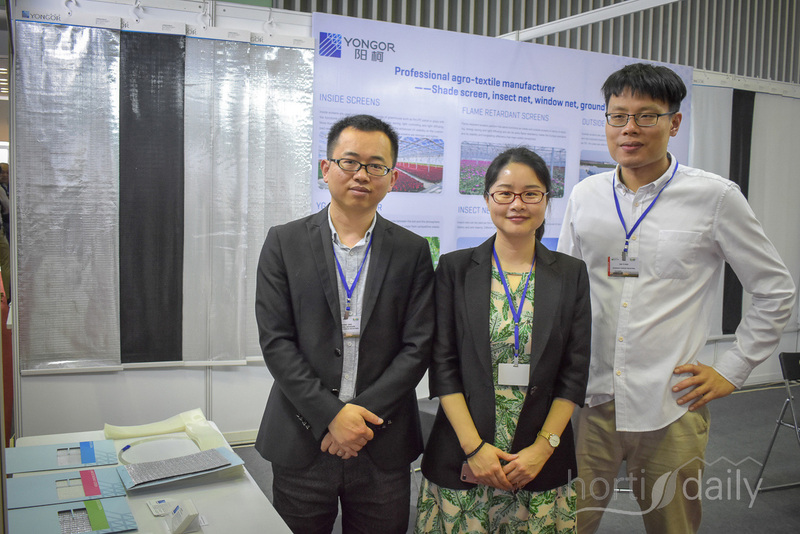 Chuong Chau, Huong Chau & Bunh Chau with Xuan Lau Plastic. 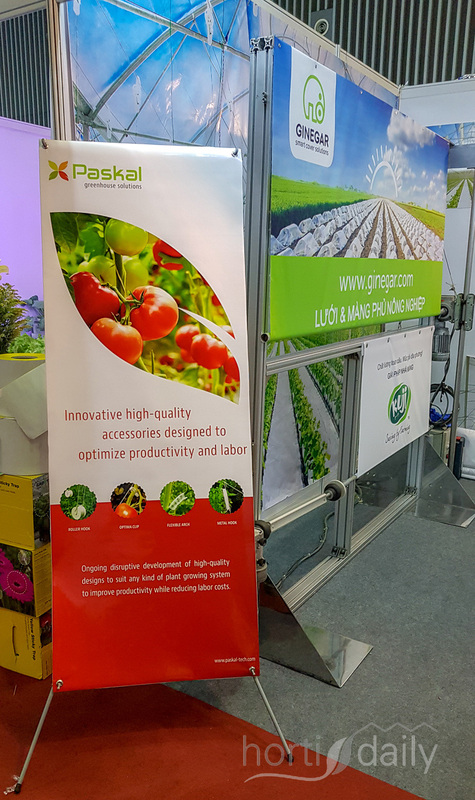 Also providing substrates is Vali Indren with Mikskaar. 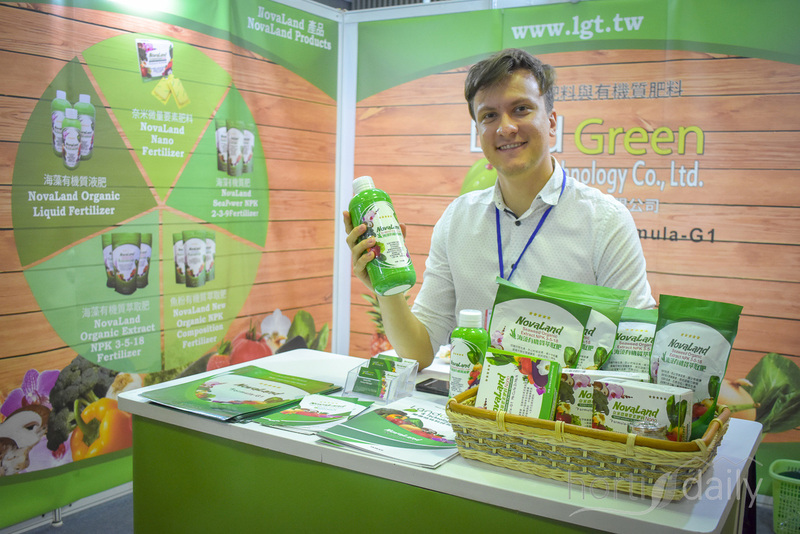 What's in a name... the team with Bio Fertilizer A+ Company provides Bio fertilizers! 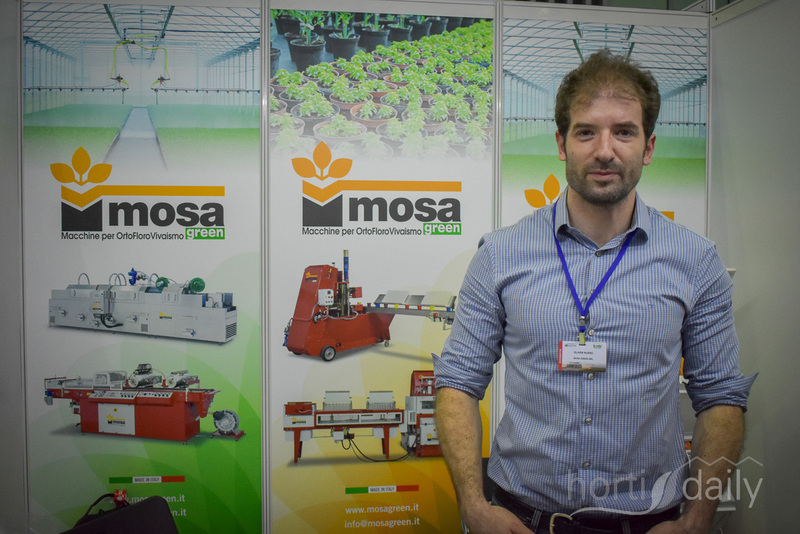 Oliver Russo with Mosa Green, showing the company's seeding machines. 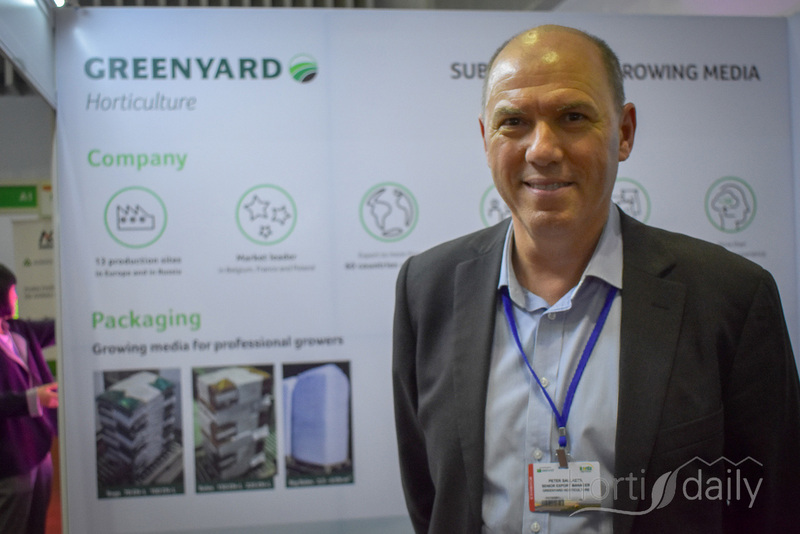 Tuff Substrates is a developer, producer and marketer of soilless growing techniques in Israel. 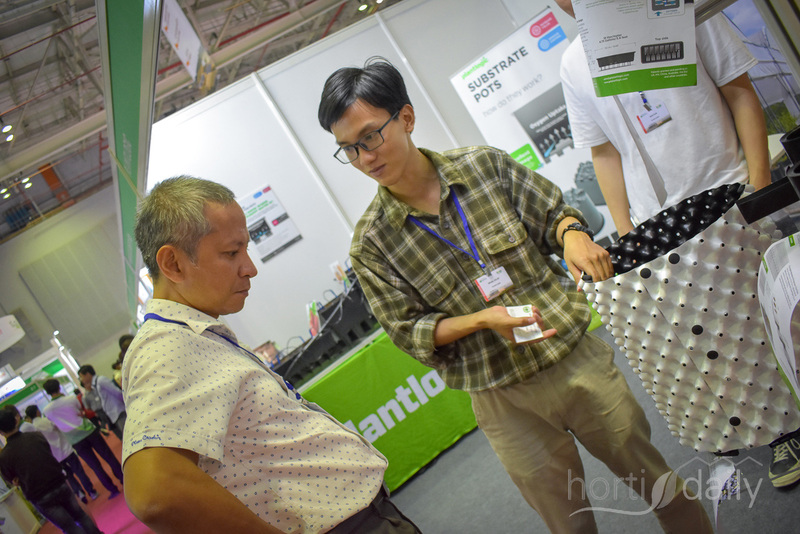 With hydroponic growing being one of the hot topics on the show, many growers visited the company's booth. 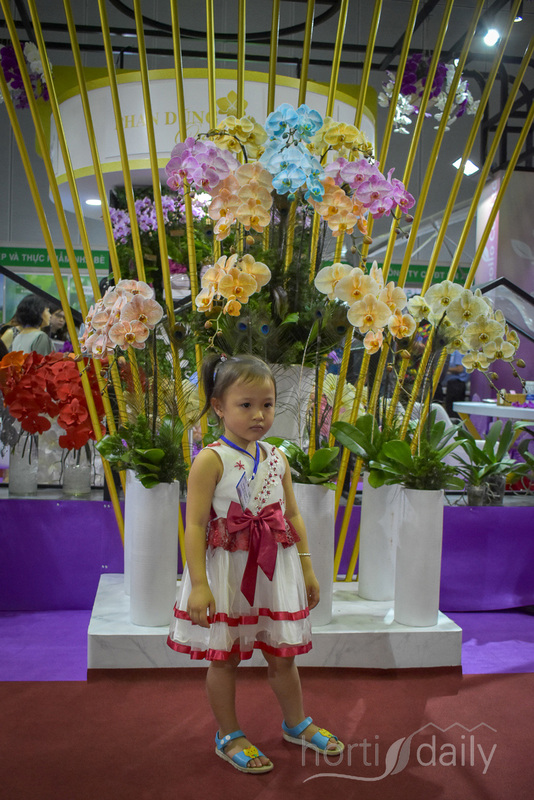 Orchids are loved in Vietnam! 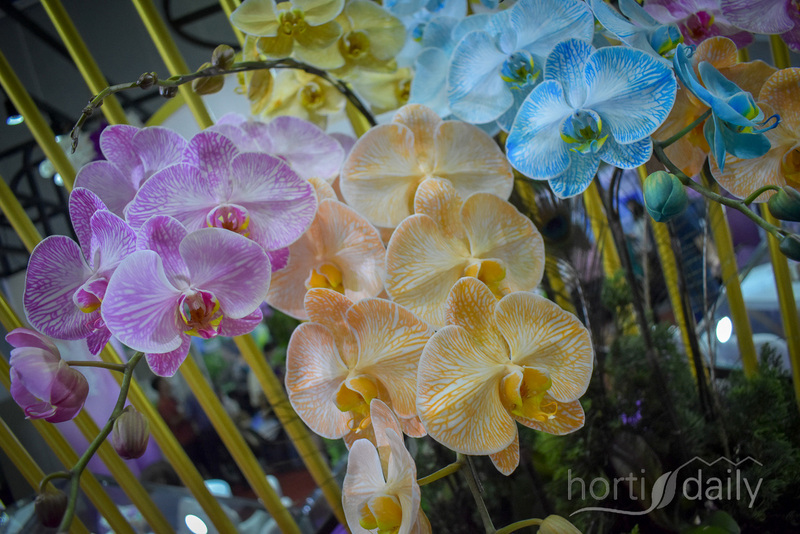 Taiwanese company Royal Base extended their Sunpride assortment of cut orchids and pot orchids with dyed pot orchids in soft colours. 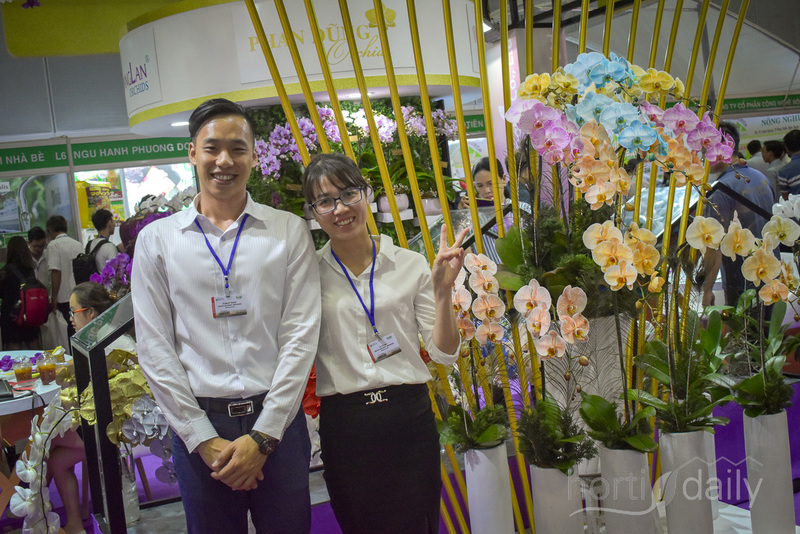 In the photo Robert Wang& Mai le Thi with the dyed orchids. 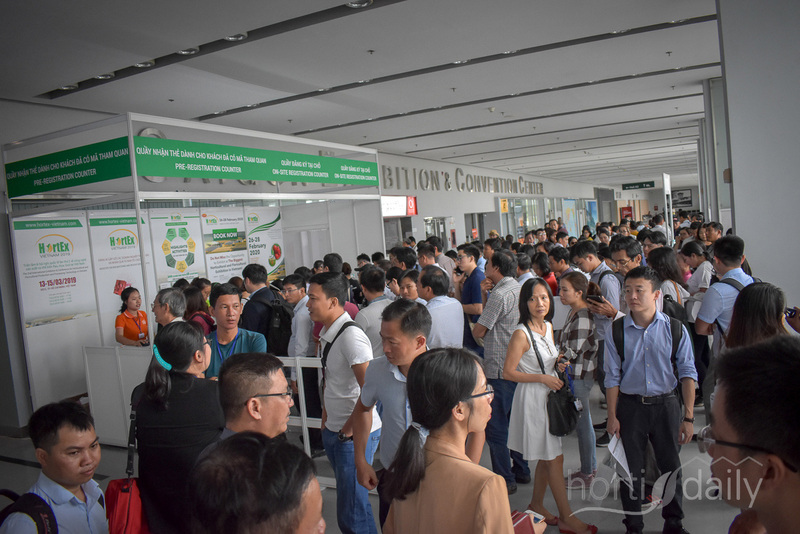 A lot of attendees for the start of the show! 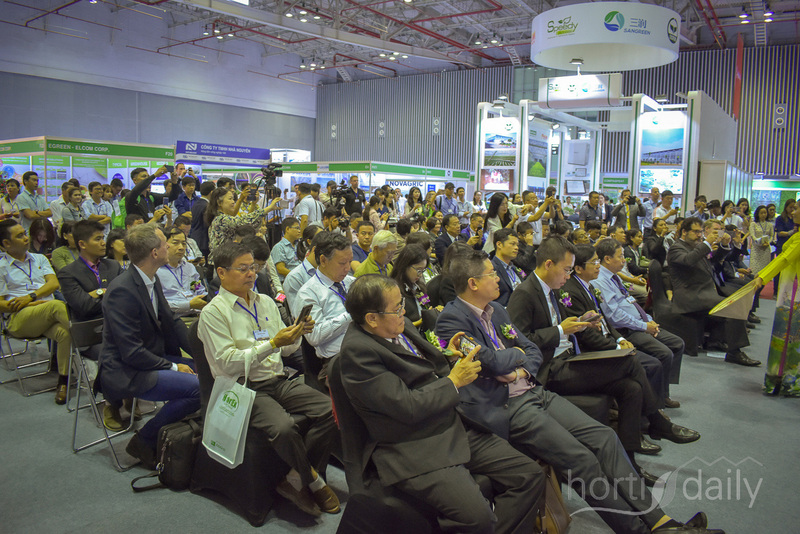 Many government officials were present during the opening of the show. 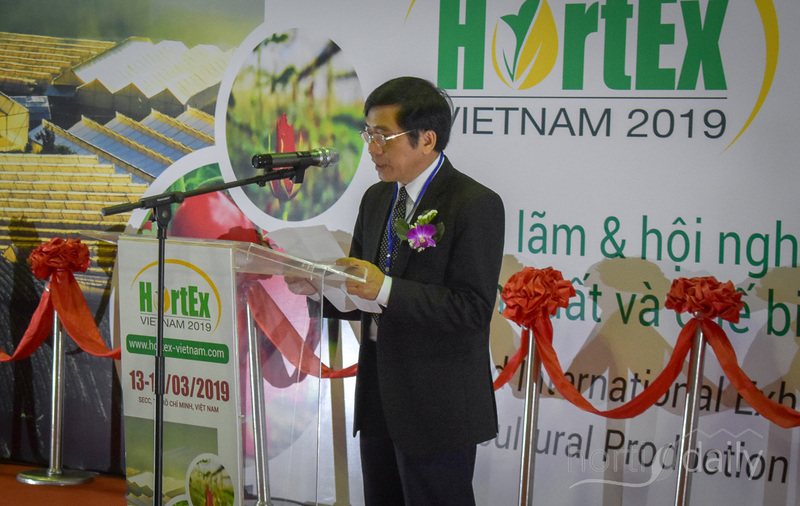 The minister from the department of crop production emphasised the wish of the local growers to move forward. 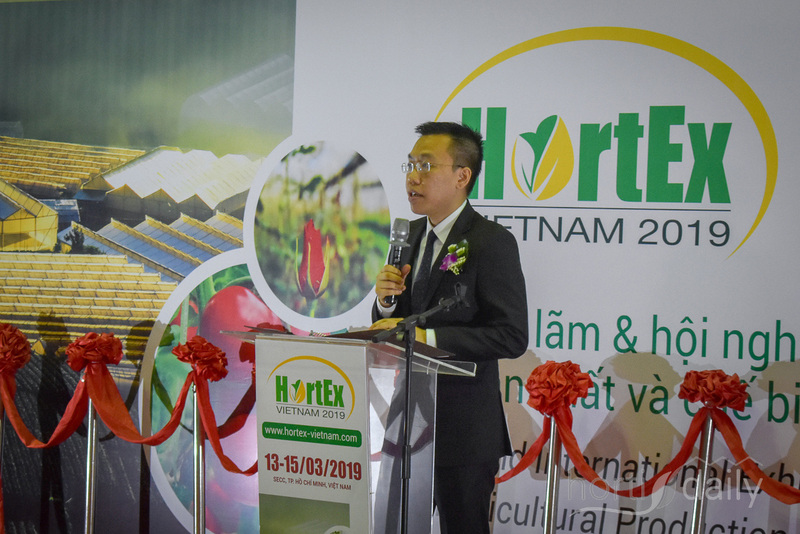 Nguyễn Quang Huy, the representative responsible for Southern affairs in the ministry of trade explained how new techniques were needed to better the quality in demand from both domestic as international buyers. 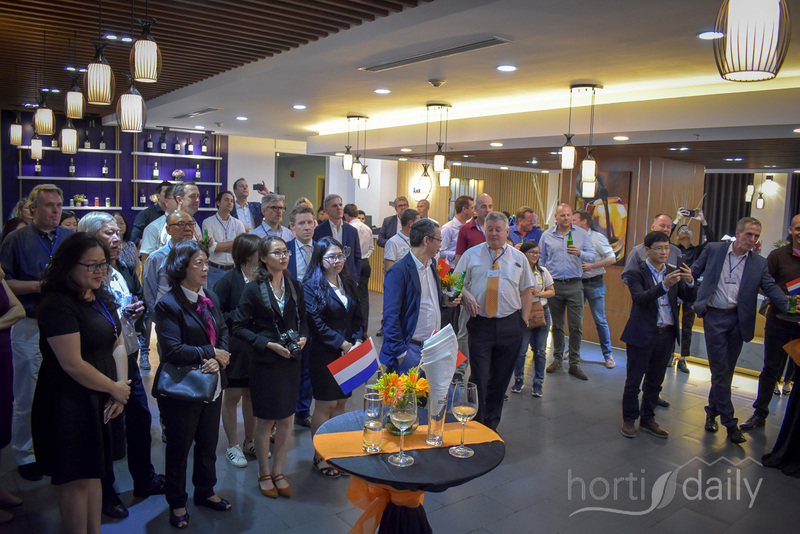 With 21 companies present, the Netherlands is a big player in the Vietnamese market and the Dutch representative showed great interest in continuing and enlarging this cooperation. 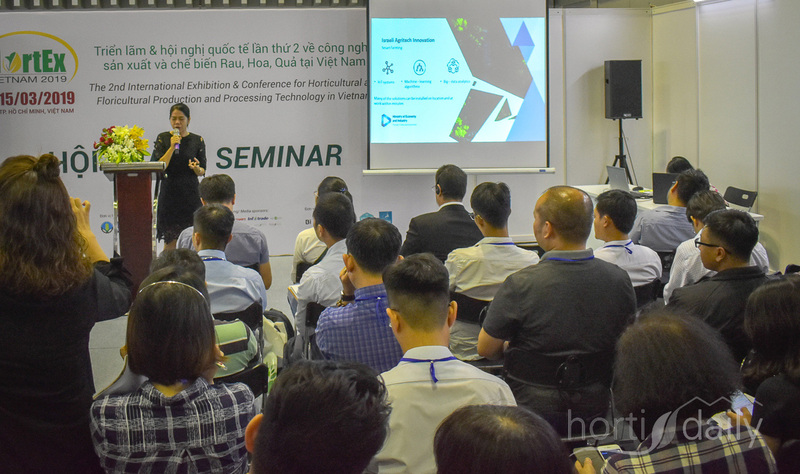 Nguyen Ba Vinh, director of Minh Vi Exhibition, organising the show in cooperation with Nova Exhibitions, presented a strong growth of the show: doubling the floor spance & a 60% growth in participating companies. 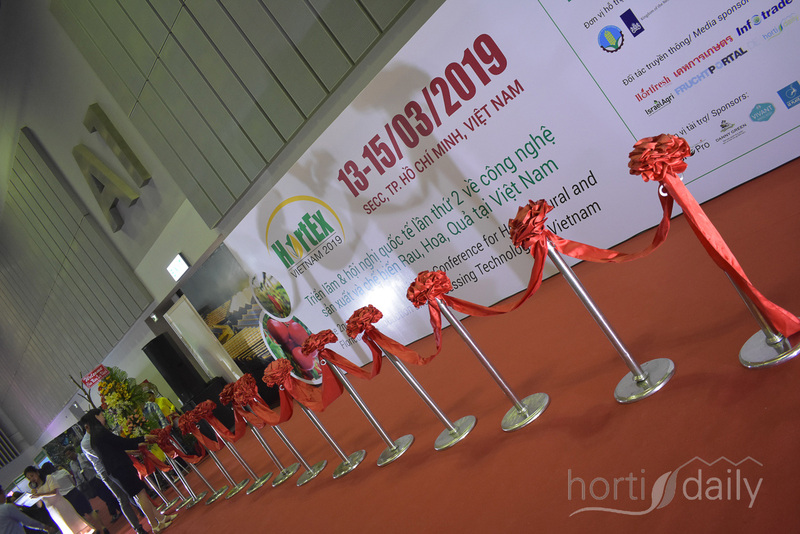 Some serious ribbon cutting taking place! And we're ready to go. 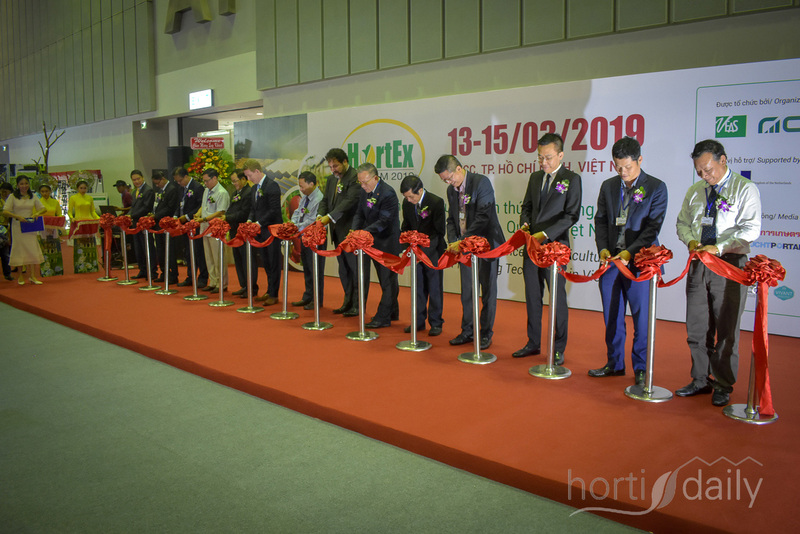 After the official opening by various representatives of the government, horticultural organisations and of course the show organisers, HortEx 2019 could get underway. 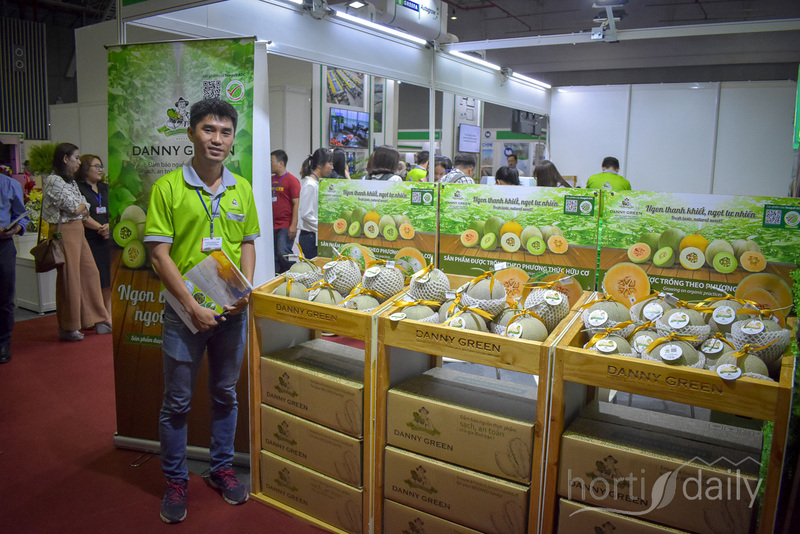 Nguyen The with Ant Farm grows fresh vegetables in Thailand. 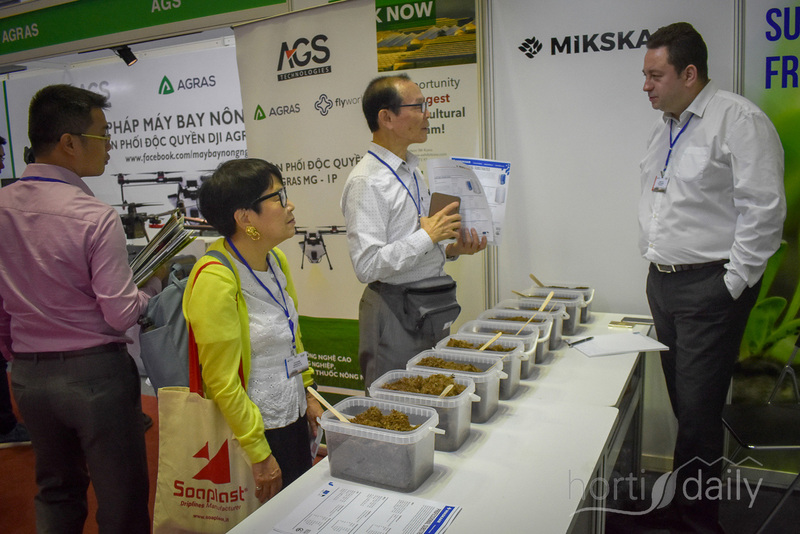 Laure Hsu shows the Novaland fertilizers and tells about the company's research centre. 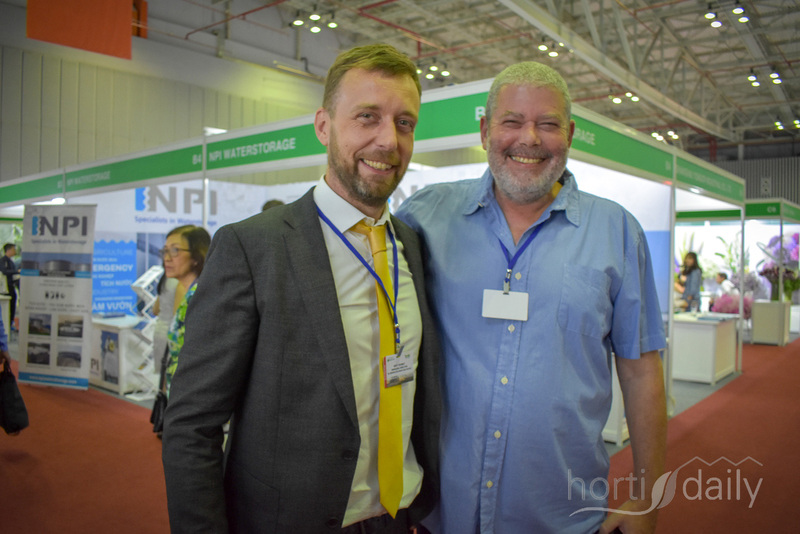 Arjen van Dijk & Erik van Geest with NPI. 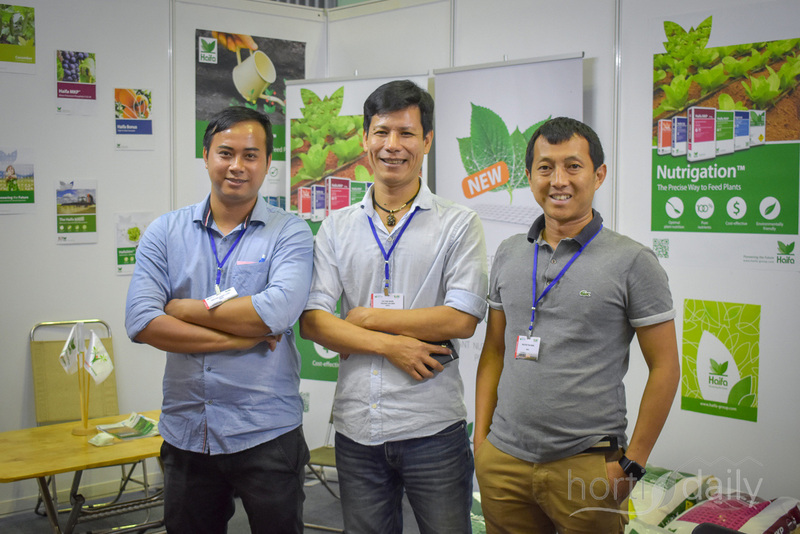 We advise you to check the last photo in the photo report as well to see a different side of these men. 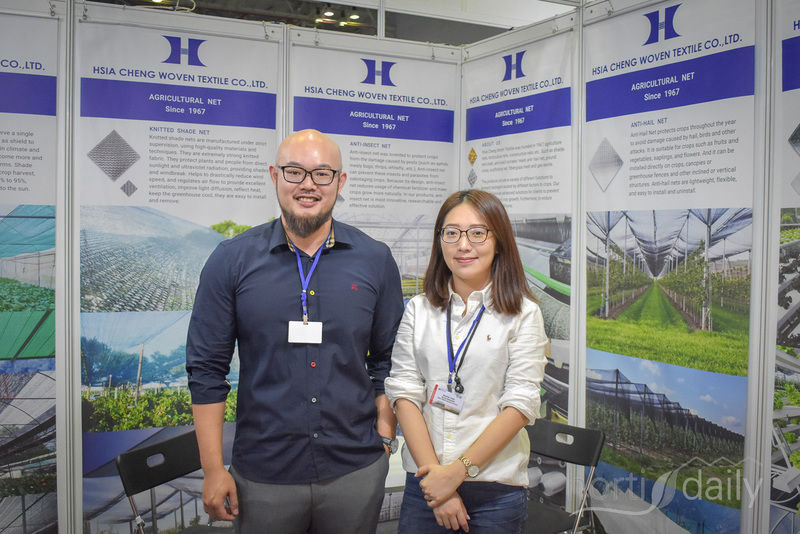 Zhu Haiping & Aiyi Zheng, Chinese suppliers of greenhouse needs. 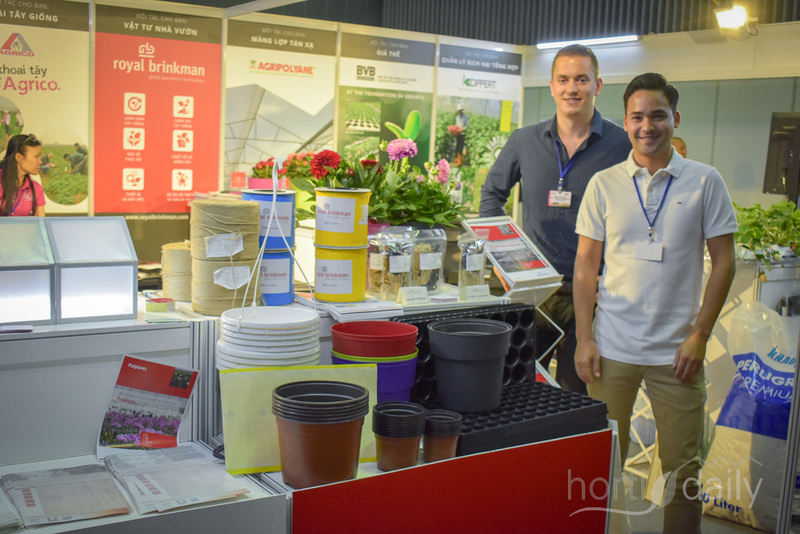 The team with Hu-Bas imports fertilisers, flower-bulbs & plants. 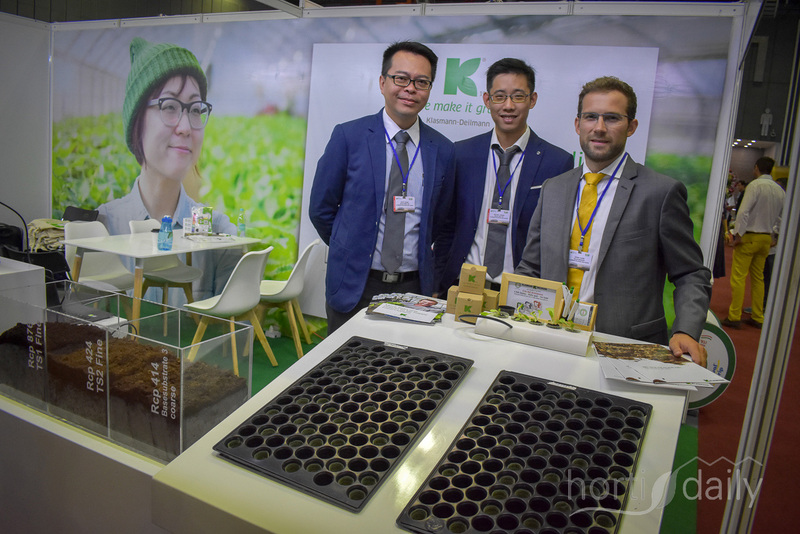 In the photo Gio Chung, managing director, and his colleague Chung Jae Woong. 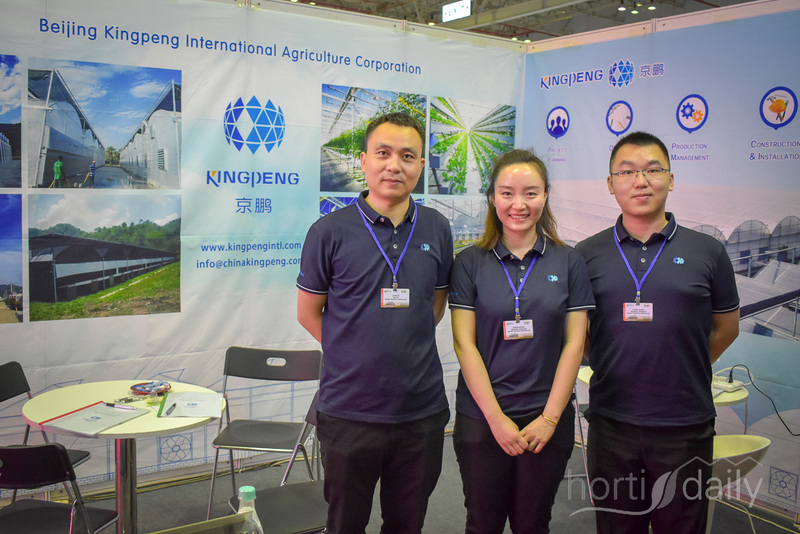 Yunnan Kunming Sanxing Greenhouse Project, greenhouse manufacturer earliest found in Yunnan. 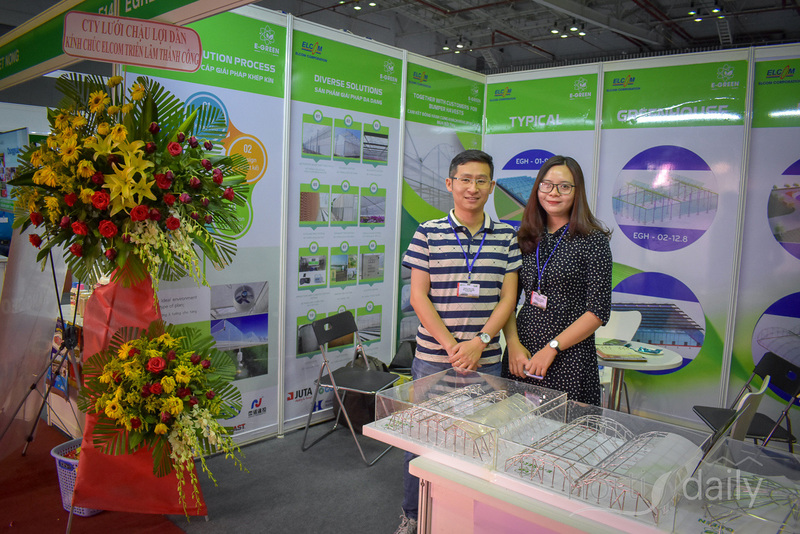 In the photo Lu Dieu Thuy & Lui Qingfeng. 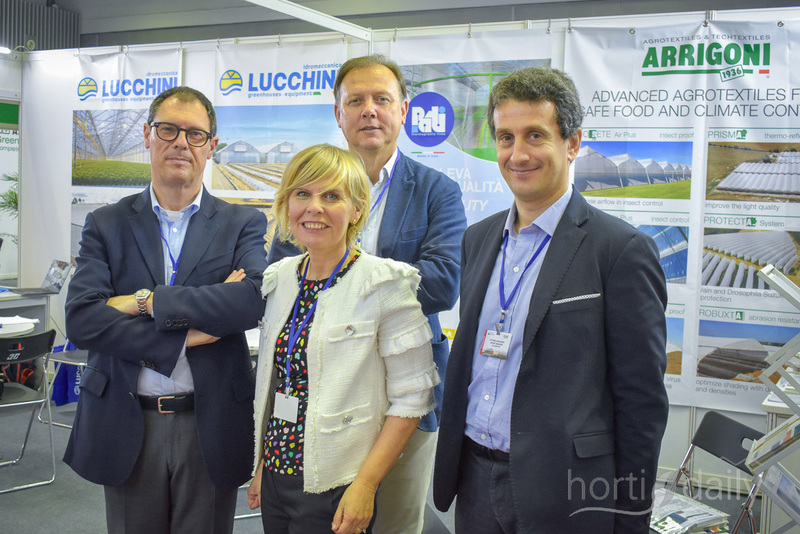 Patrizia Giuliana with Arrigoni, Pier Luca Paolin & Luigi Pezzon with PATI International & Vittorio Genuardi with Lucchini Idromeccanica met up with the Italian consul, Mr. Dante Brandi, the day before the show. 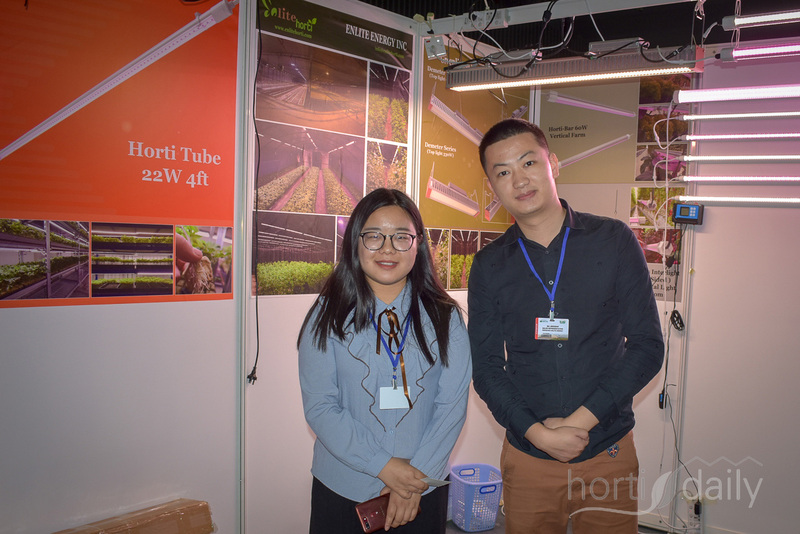 Alison Zhang & her colleague from Enlite Horti. 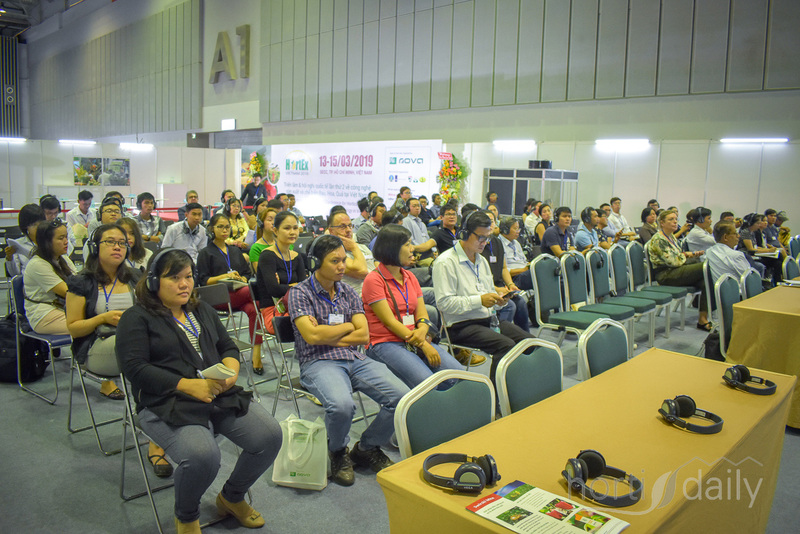 With growers being eager to improve their business, the seminar program was visited well. 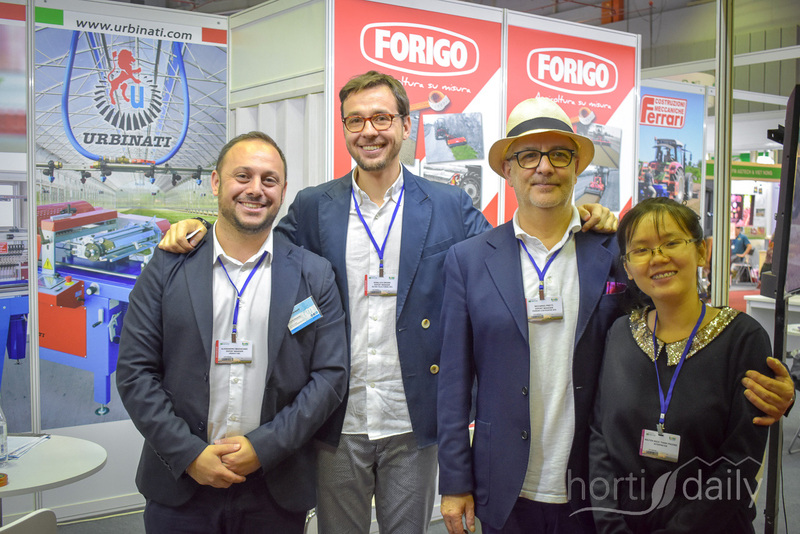 Stefano Villami (OCMIS) & Stefano Curini with Rovatti Pompe. 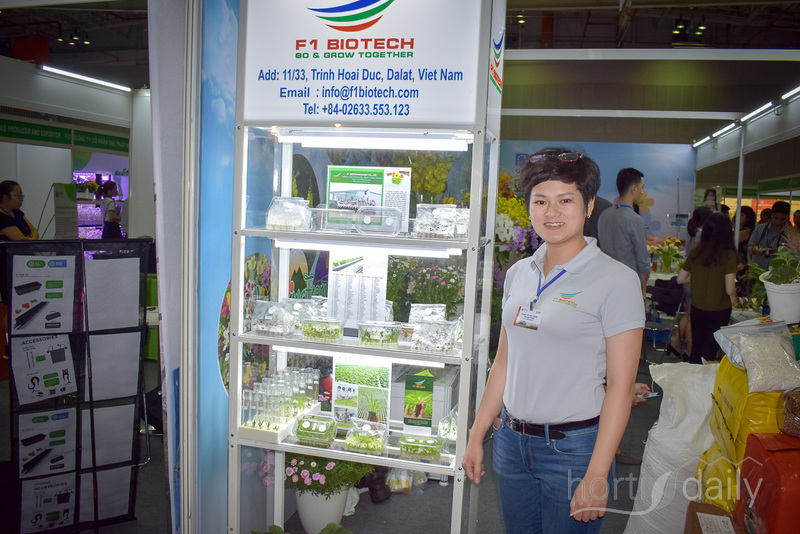 Duong Hoang with F1 Biotech. 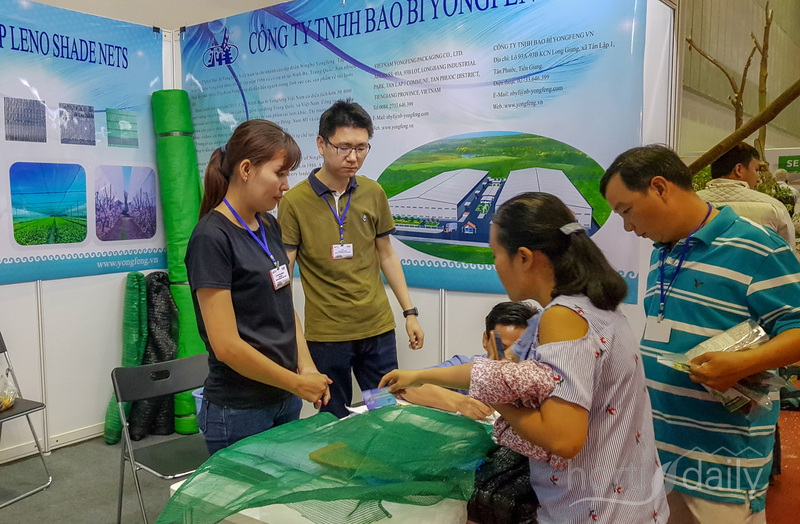 The laboratory provides various services for tissue breeding. 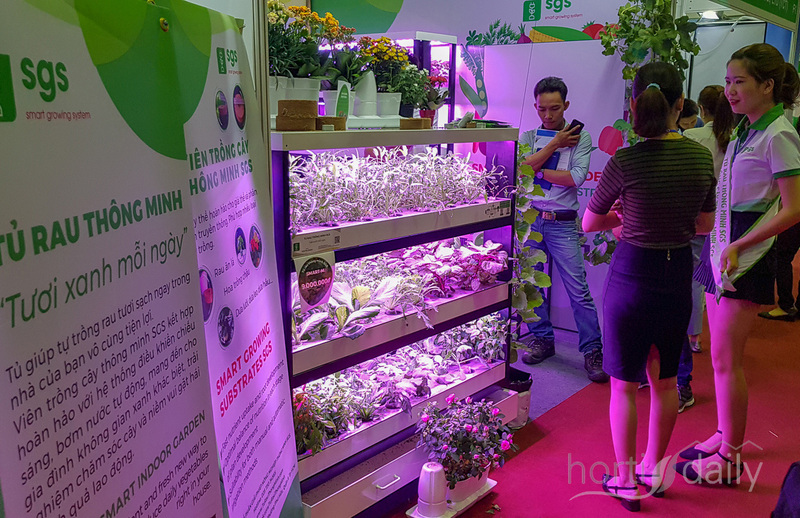 Plantlogic provides growers with easy and low-cost solutions for growing hydroponic. 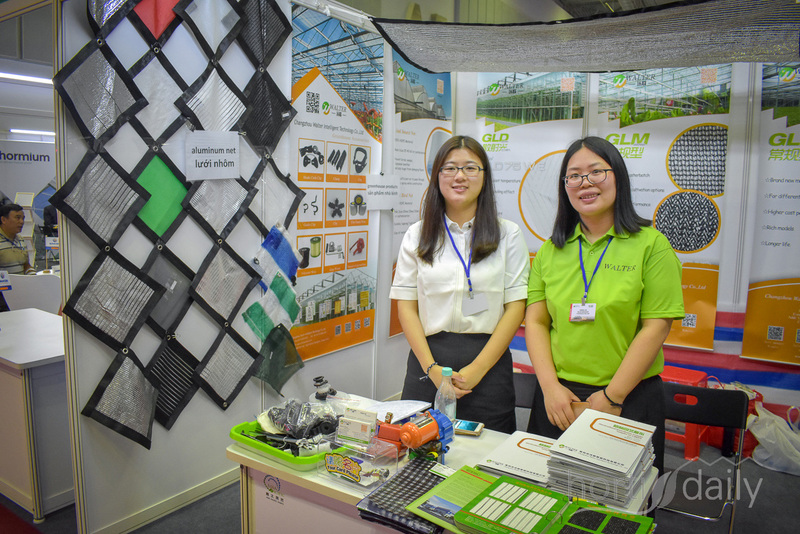 Winnie Wang & Anna An with Wo Lian show the nets & aluminium solutions of the company. 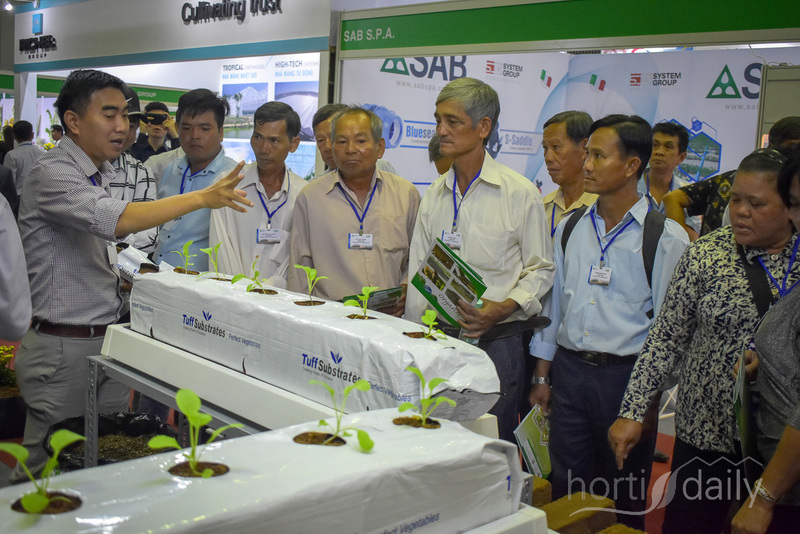 The Haifa team shows the nutrigation solutions: feeding the plants in a precise way. 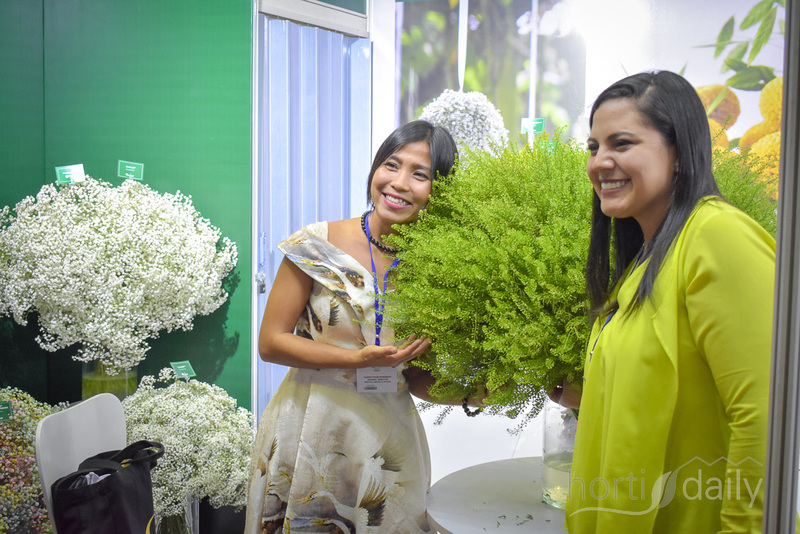 Danziger & Florsani Ecuador are present together to show to Vietnamese visitors opportunities of high quality, Ecuadorian grown flowers. In the photo Anat Moshes, Gonzalo Garcia, Daniel Kaufman & Belen Garcia. 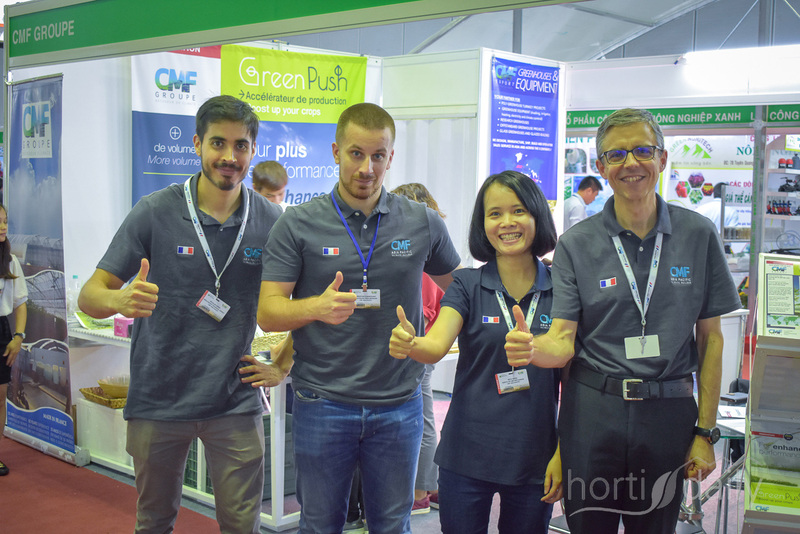 Nicolas Sibra, Corenthin Chassouant, Anyta Nguyen & Renaud Josse with the French CMF Groupe, showing the various Greenpush products for various climates. 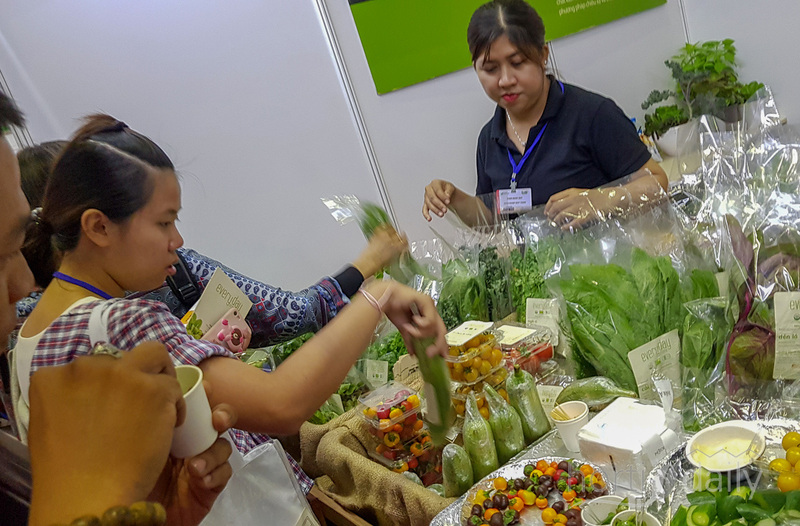 The Vietnamese growers of O Xanh Farm grow melons, tomatoes & cucumbers in a modern farm, about a 100 km from Dalat. 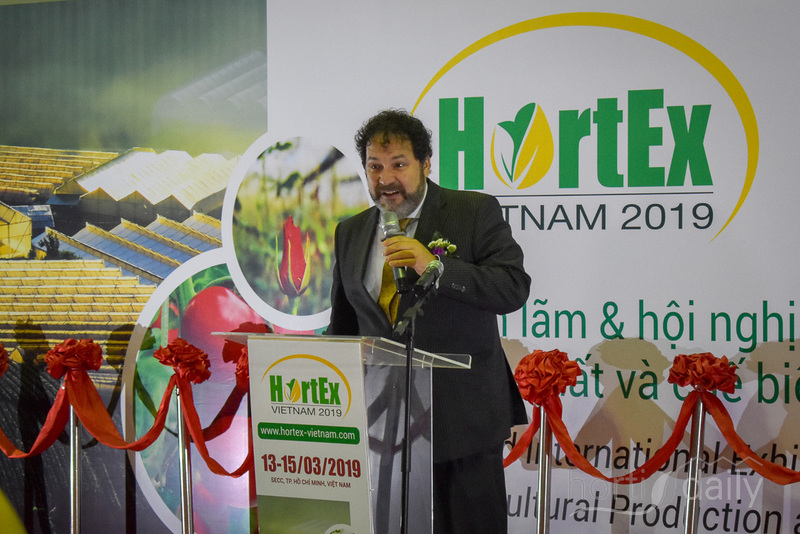 "Vietnam has the ambition to become a regional and global player in agriculture and horticulture," says Willem Schoustra, Dutch agriculture council for Vietnam and Thailand. 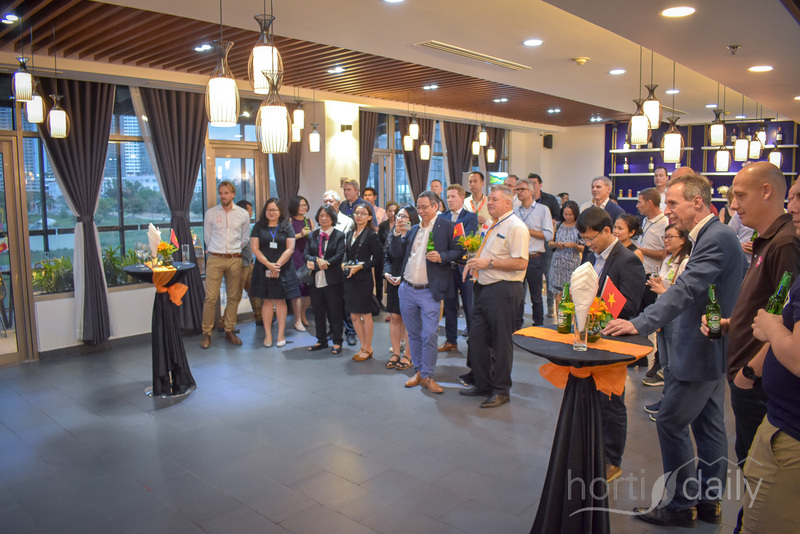 He hosted the Holland Networking Reception on Thursday. 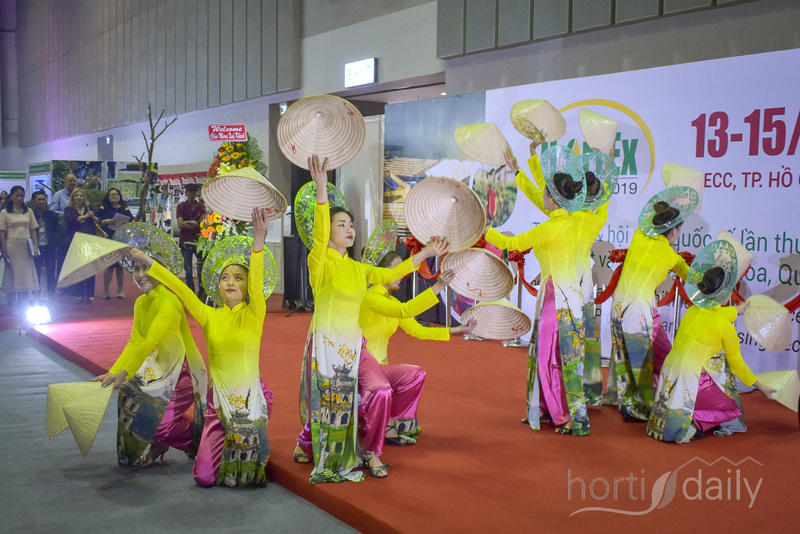 And see you next year, when the HortEx will take place from February 26th - 28th. 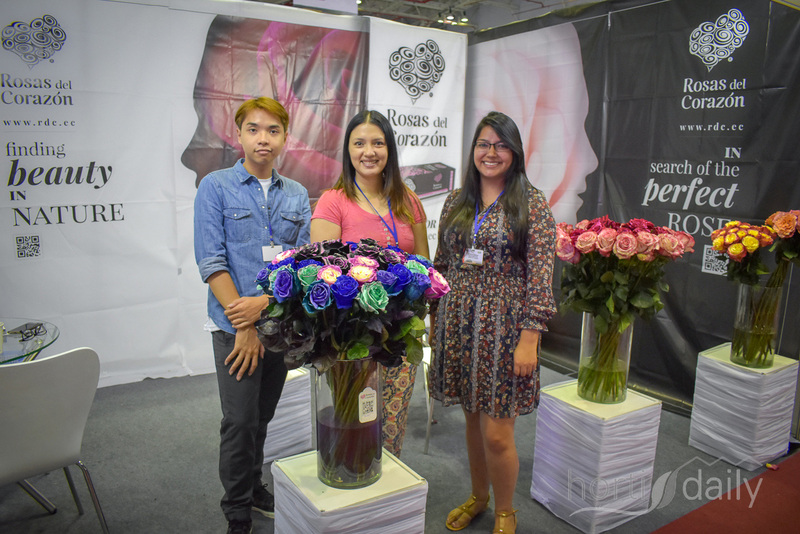 Paola Tapia, Kyastin Gonzaga & HO Thanh Huy with Rosas de Corazon, showing their Premium Ecuatorian Roses. 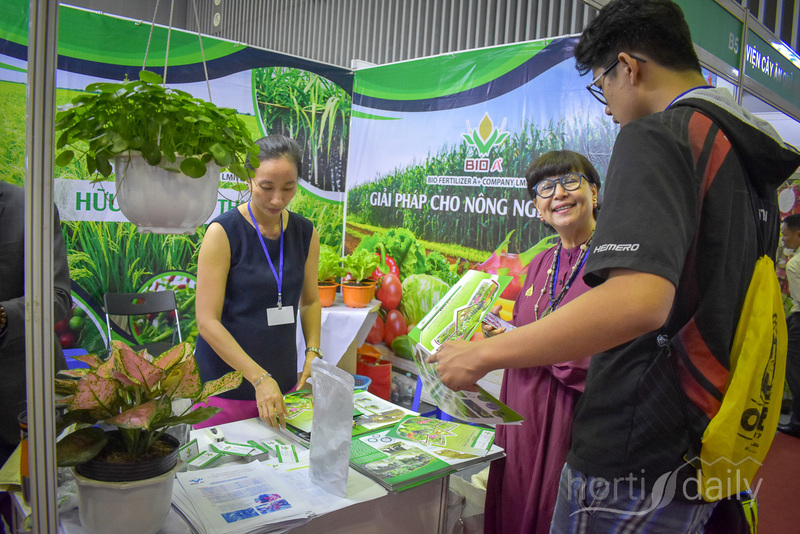 Nguyen Hoc Thi & Nguyen Thi Lien with Dalat Hasfarm, presenting their fresh produce & flowers and their Bio Pro products: A range of beneficial insects and fungi. 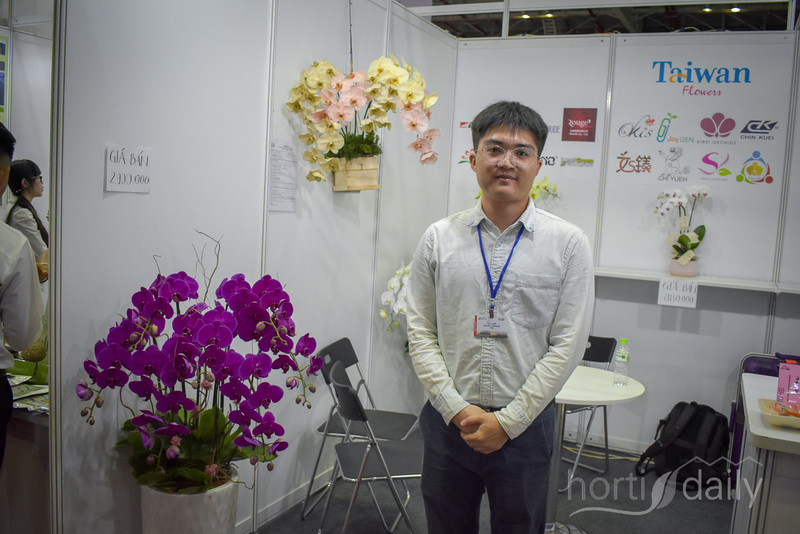 Yu-Wei Lin, Taiwan Floriculture Export Association. 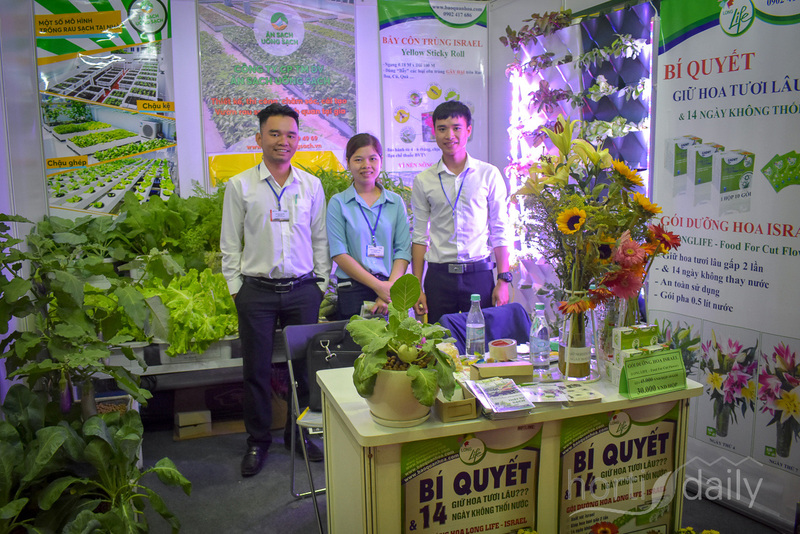 Bui Thi Duyen, Le Duy Tung & Phan Thi Bich Ngoc with Eco Footprint Co, Vietnamese supplier of products for sustainable horticulture. 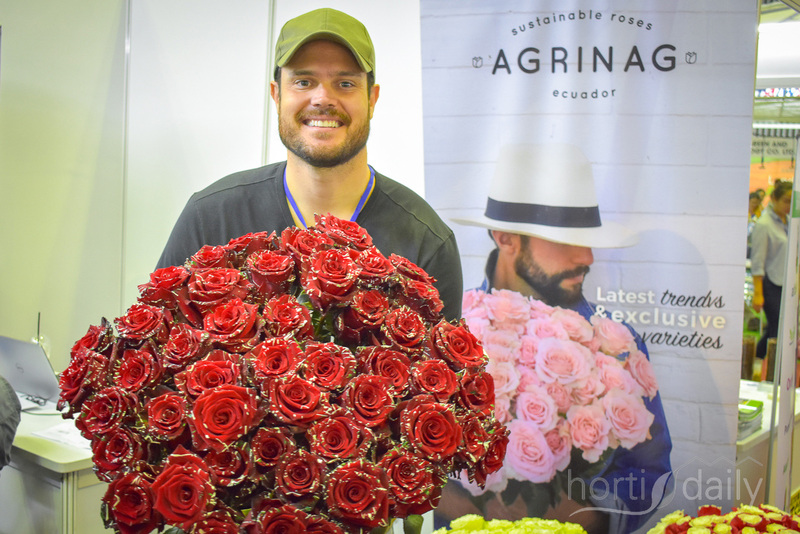 Juan Pablo Torres with Agrinag came all the way from Ecuador to show the company's exclusive rose varieties. 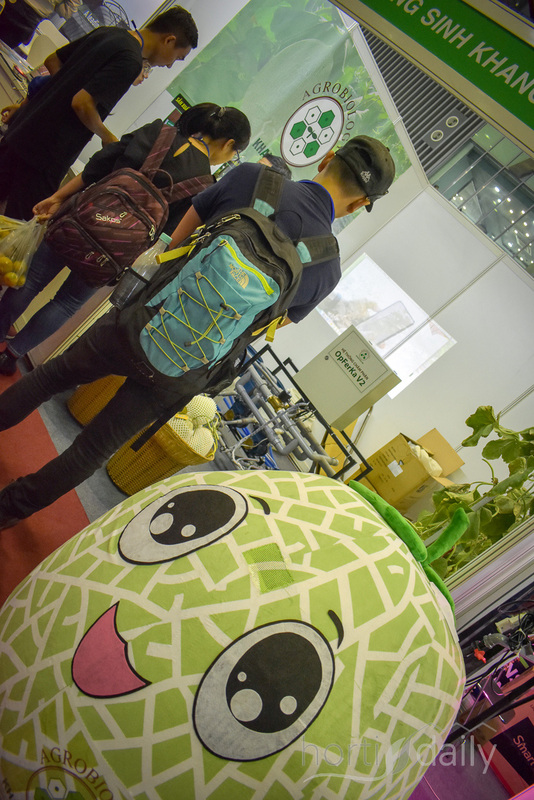 They turned out to be very popular! 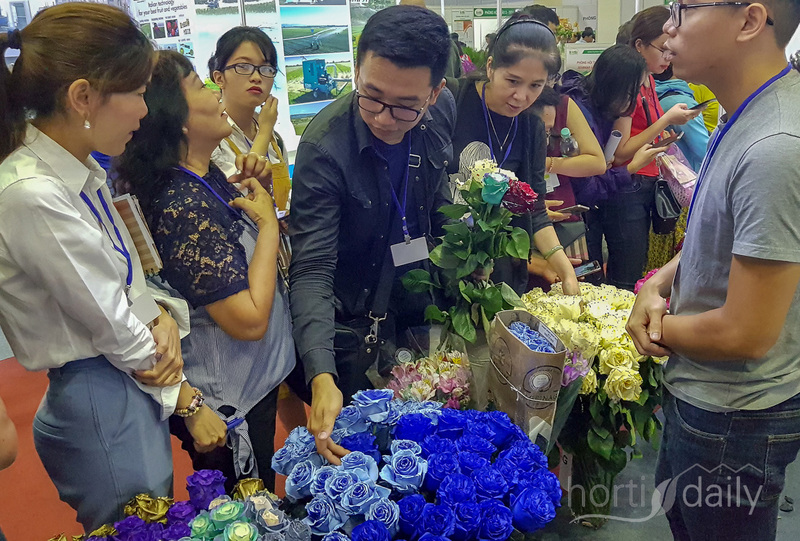 As said: a LOT of attention for their flowers. 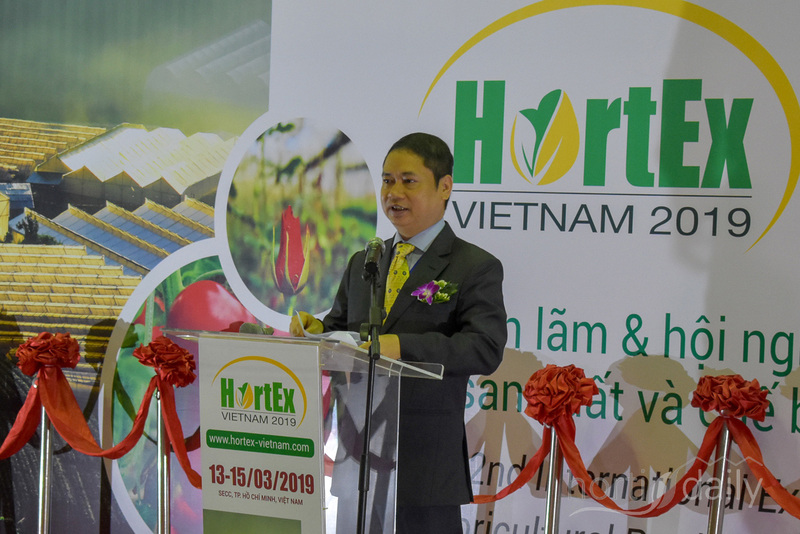 As part of the expansion of its activities in East Asia, HortiLand took part in the HortEx Vietnam 22019. 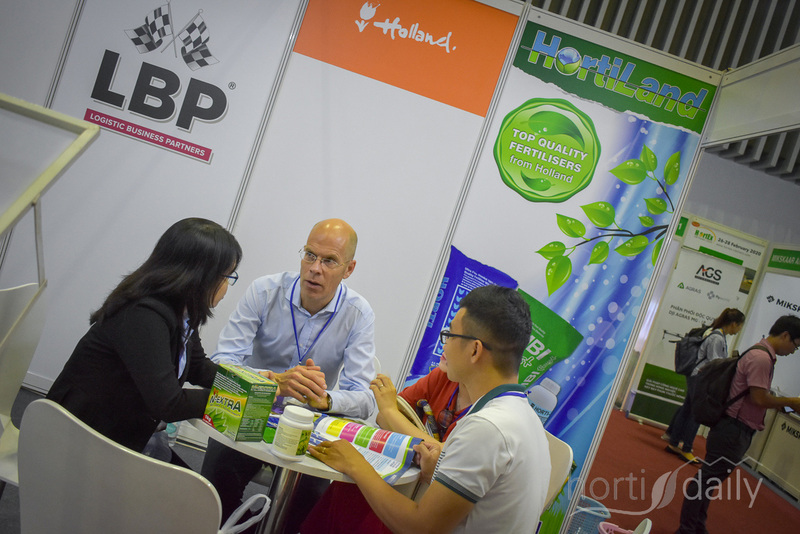 In the photo Stan Fijnaut with Hortiland explains to growers about the fertilisers the company offers. 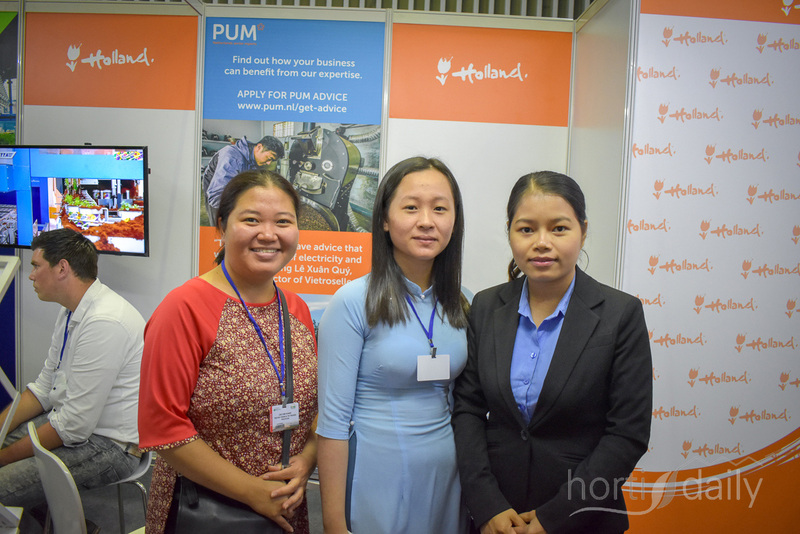 Knanh Kim Caowith Truyen Thong, Le Thi My Duyen & Huong Nguyen Thi Mai with PUM Netherlands, setting up arrangements between senior experts from the horticultural industry & companies from uprising countries. 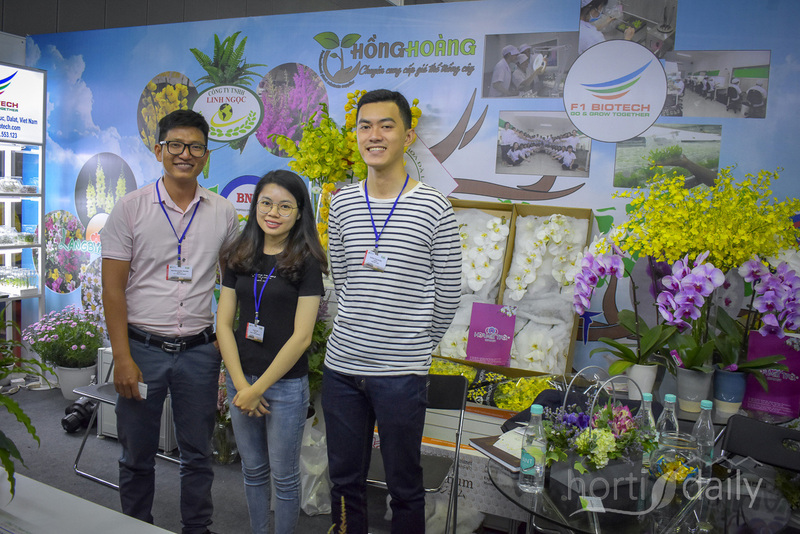 The team with Thuoc Duong Hoa Tuoi presented solutions to endure the life of cut flowers. 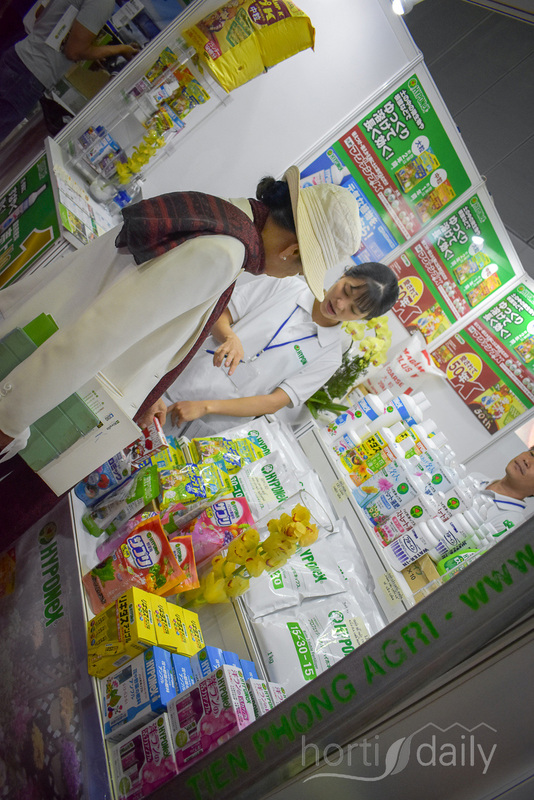 The Fresh Express products were shown on the show. 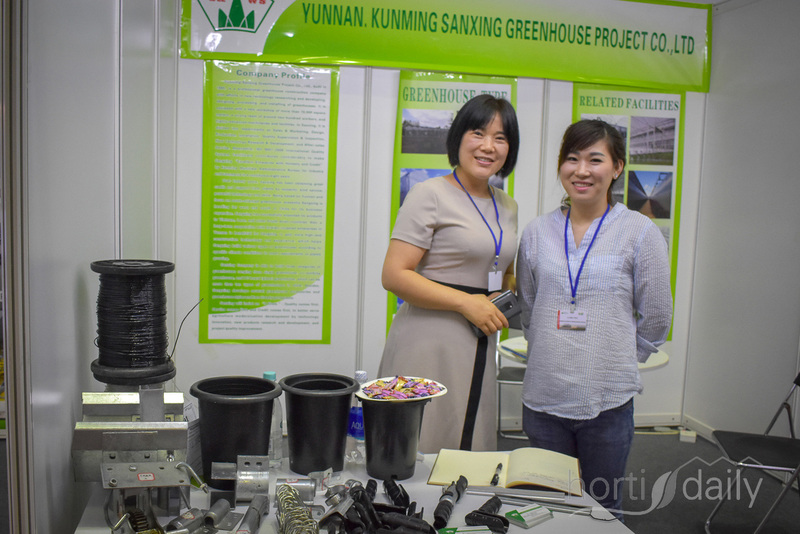 The OpFerka electrolysis system was shown on the show, helping growers to better their water quality. 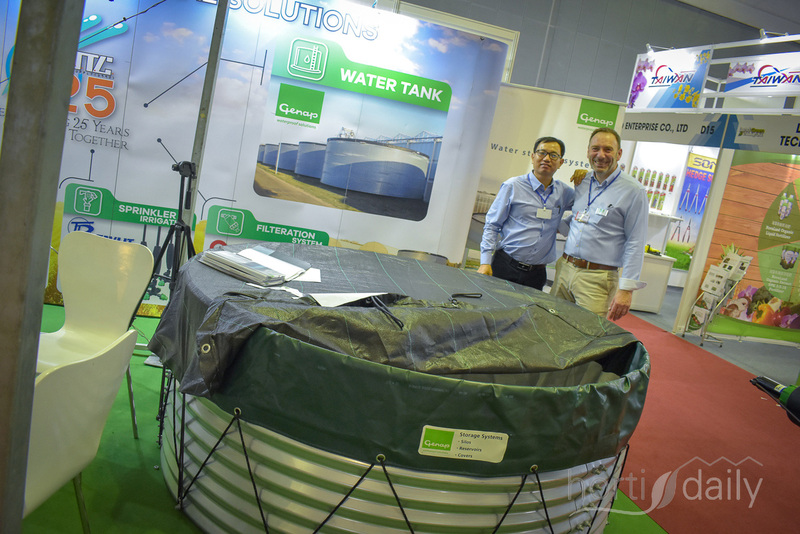 The team with Elcom provides greenhouse & automation solutions. 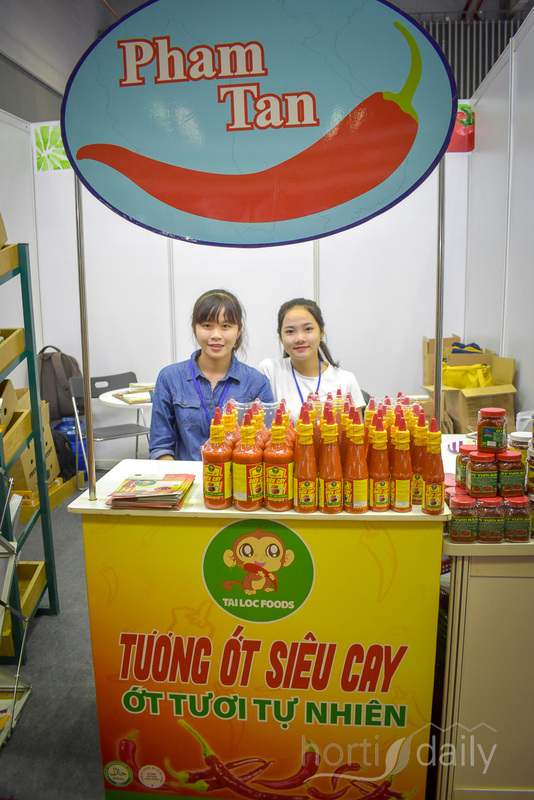 In the photo Quach van Luan & Nguyen Thilan Anh. 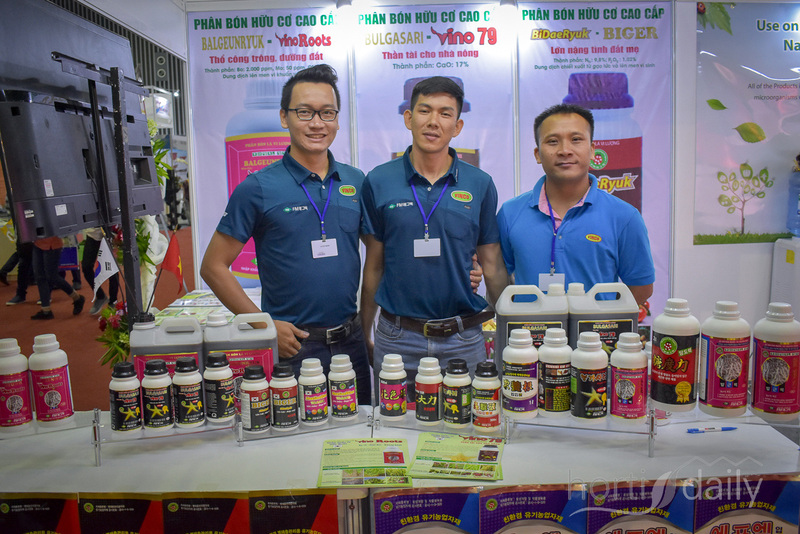 Le Duy Nhan & Vu Truong Xuan with Vietnong Fertilizers, joined by Tyong Quag Caohj with FM Agtech. 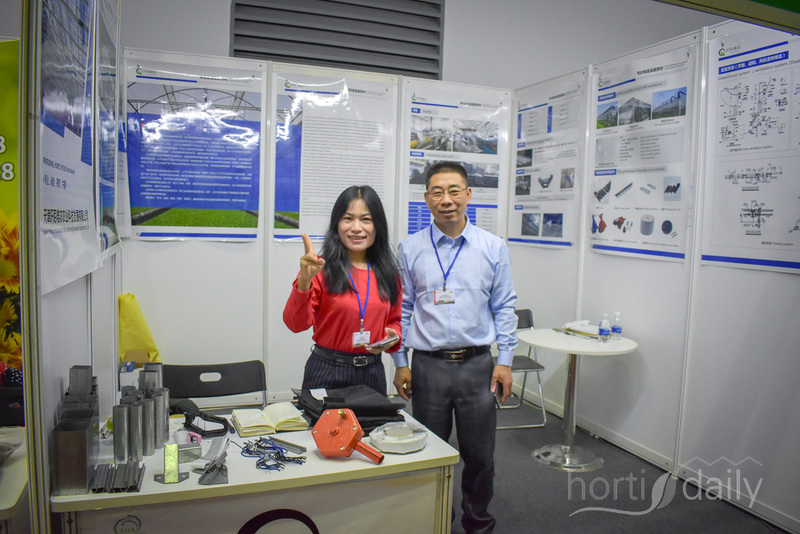 Nhan Vien & Nguyen Thi Ha with Bhalsar International. 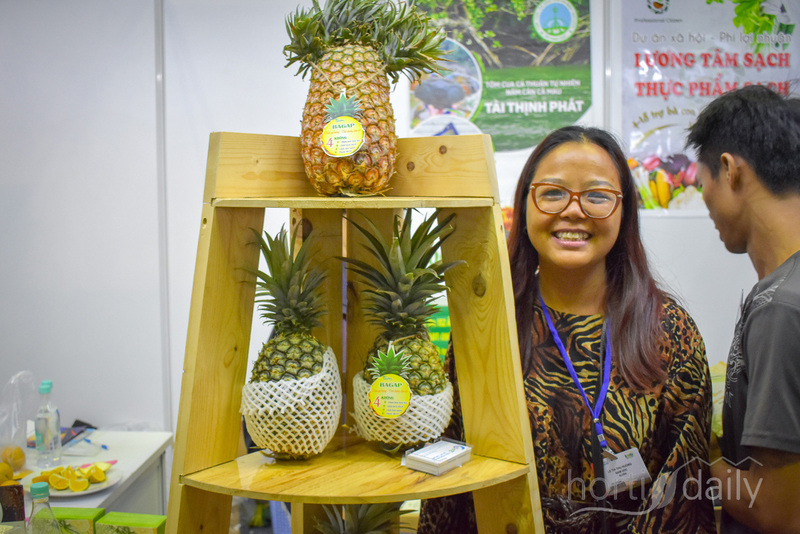 Le Thy Thai with with Bagap, growing pineapples. 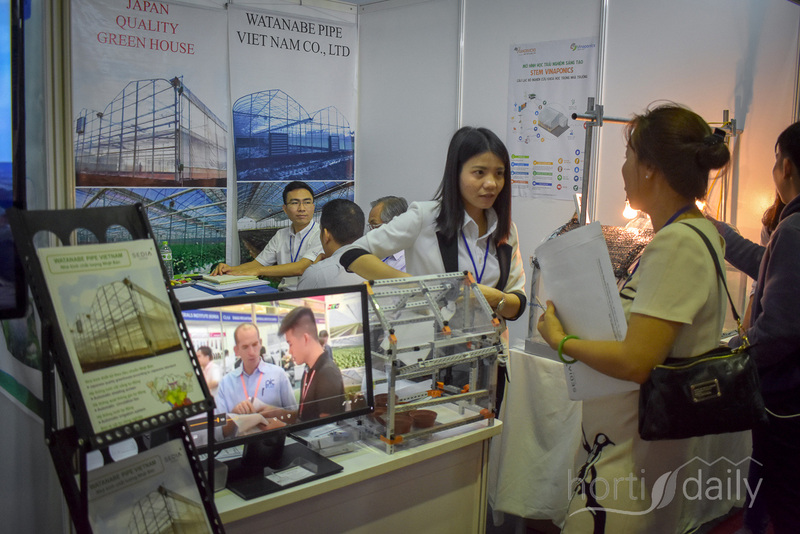 Tinh Binh Duong, growing mandarins & providing them to the domestic & international market. 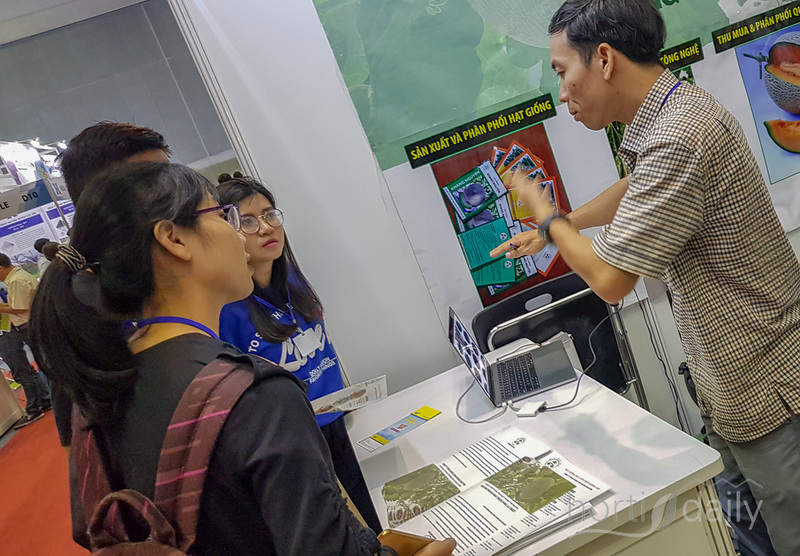 Israphong Sananmuang with NSTDA Technology. 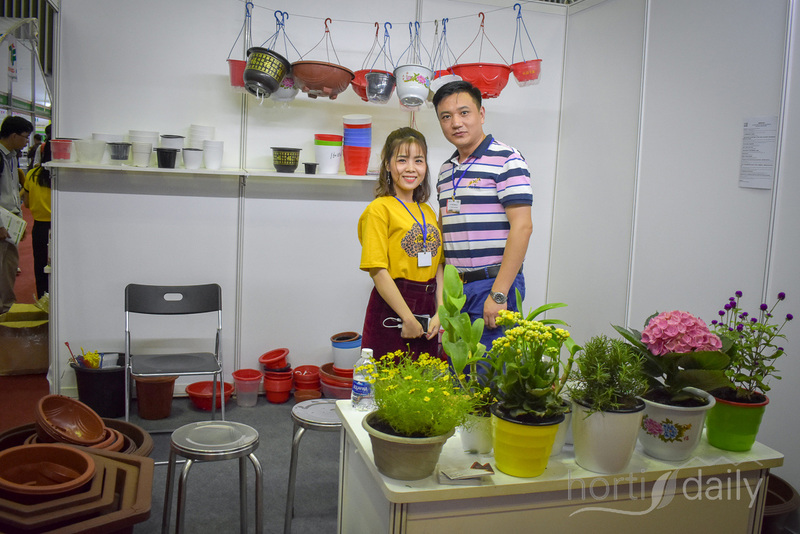 Han Thinh, providing pots for the floricultural industry. 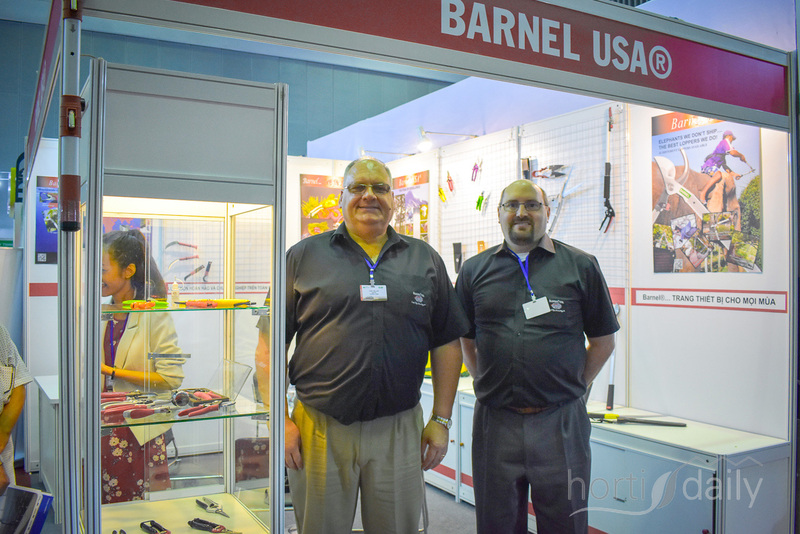 Karl Zeller & David Horning with Barnel USA. 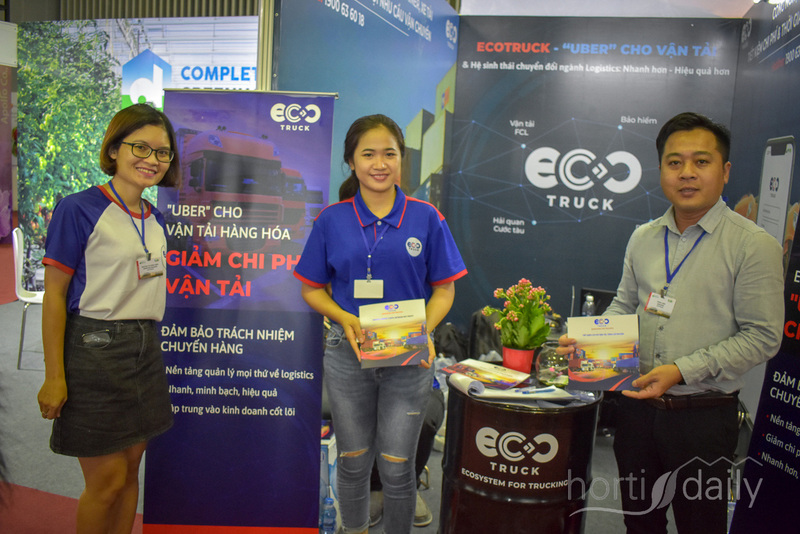 Eco Truck is a new initiative and wants to be the Grab / Uber of logistics. 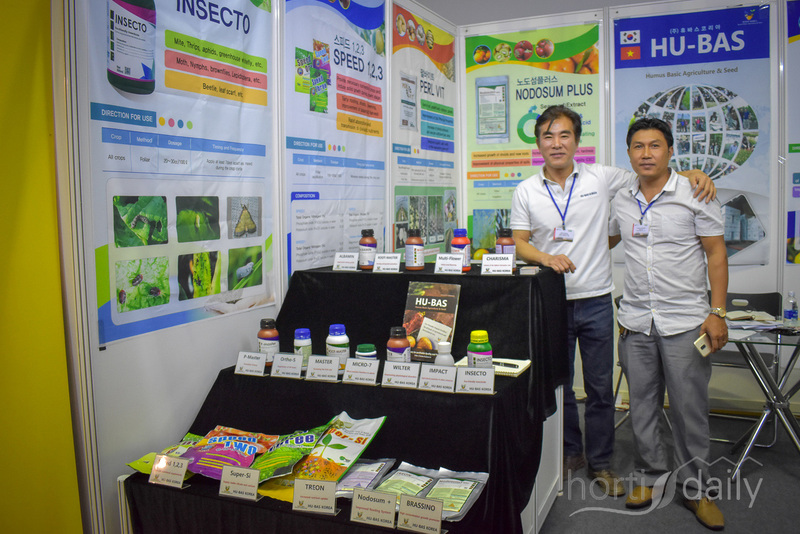 Hyponex Powder is a chemical fertilizer helping flower / plant growers achieve better results. 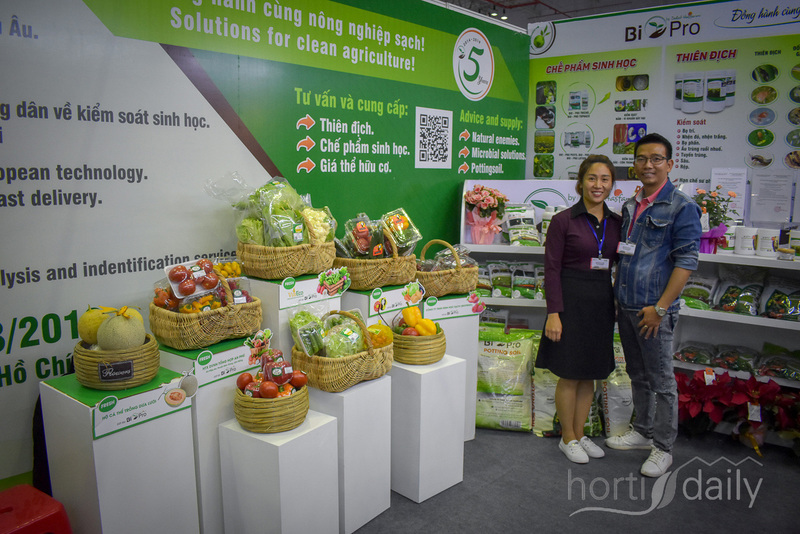 Pham Cong Thanh with the Vietnamese supplier Tien Phong Agri. 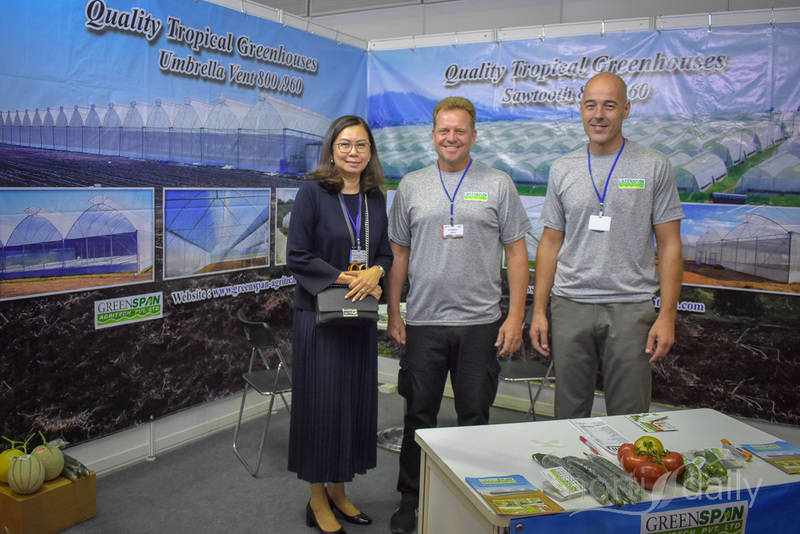 Watanabe Pipe was founded in 1953 and offers products ranging from all sized greenhouses as well as consulting for large-scale cultivation systems. 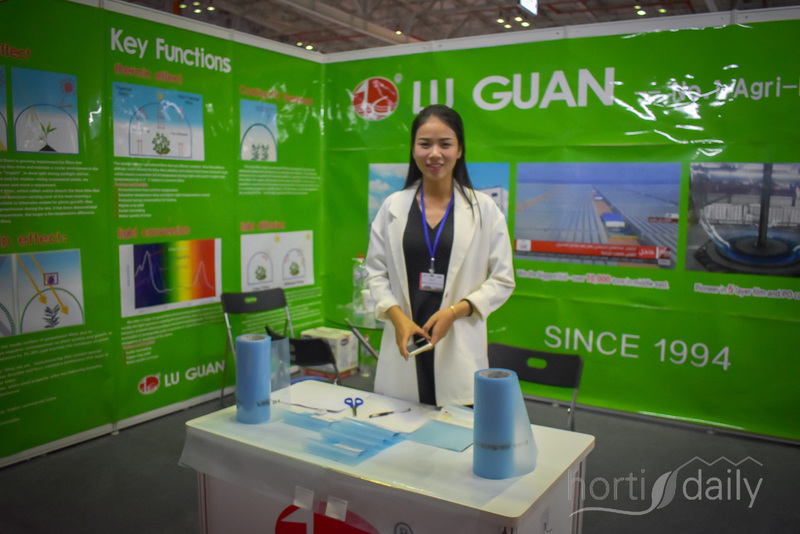 Tianjin Qianmo Weinong is a Chinese agricultural science & technology development company. 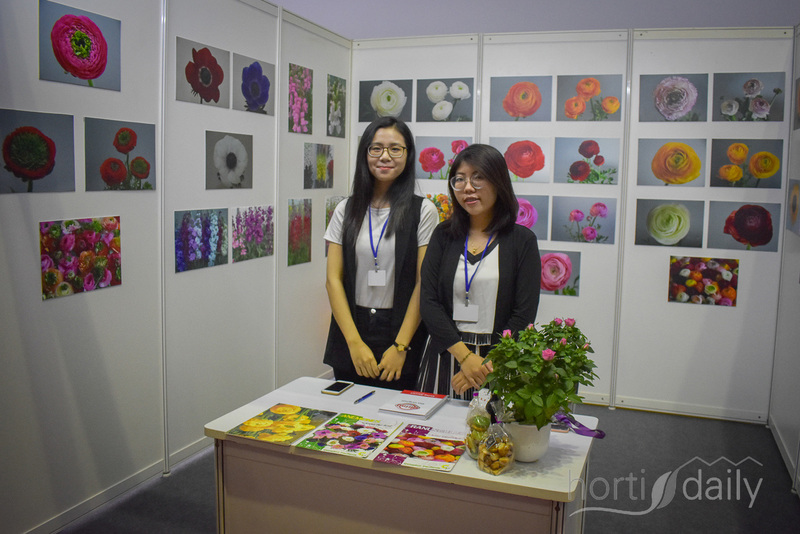 In the photo Tins Haochen. 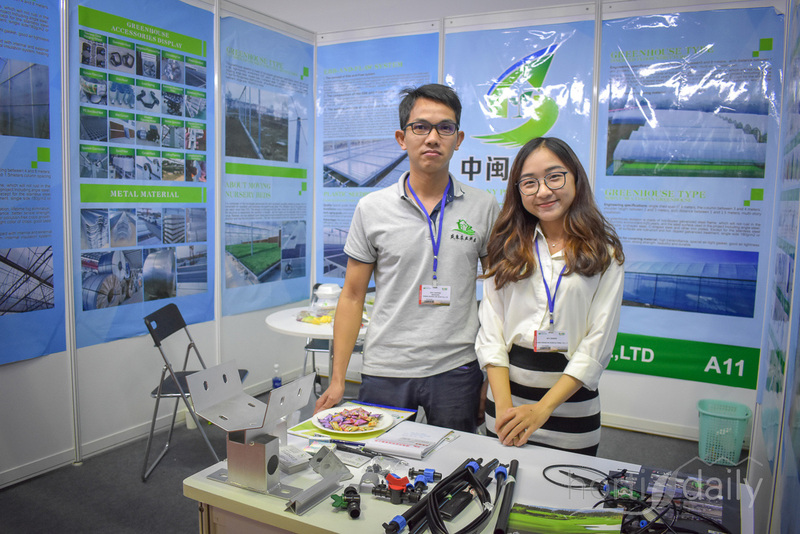 Lei Xu, manager of Luguan Plastic, was taking a walk on the show so his colleague was in the photo this day. 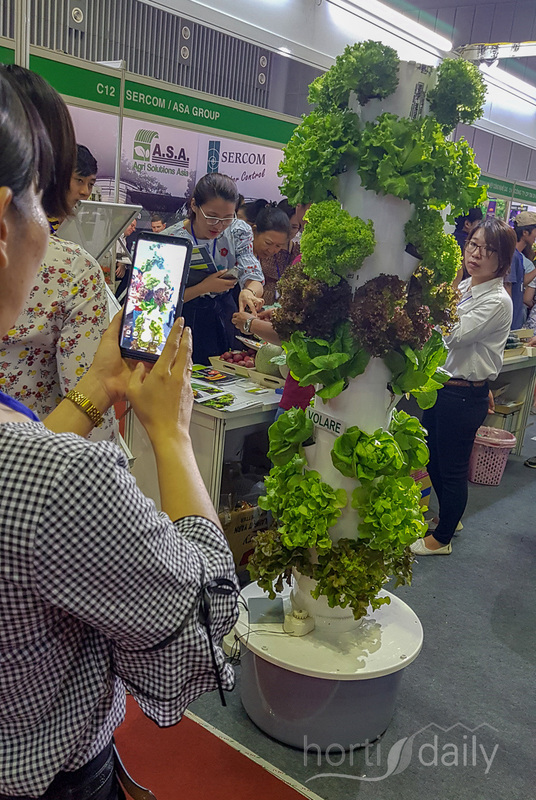 The Enza Zaden products gained a lot of attention - hydroponics is hot. 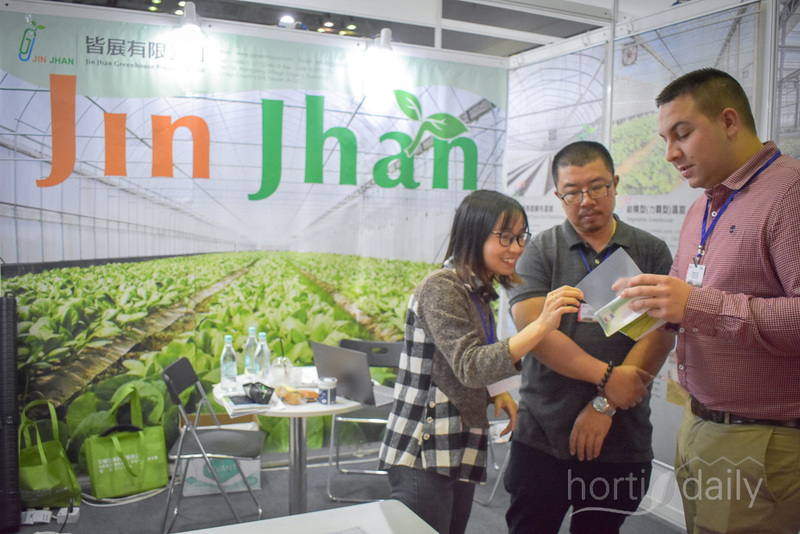 Everyday is the brand for greenhouse vegetables in Vietnam and possible exports. 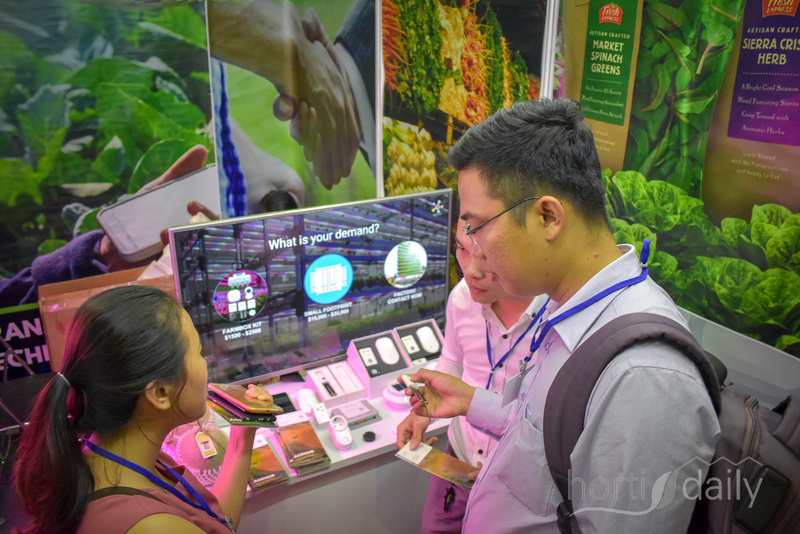 The Smart Growing System & Smart Growing Substrates present options for indoor farmers & homegrowers. 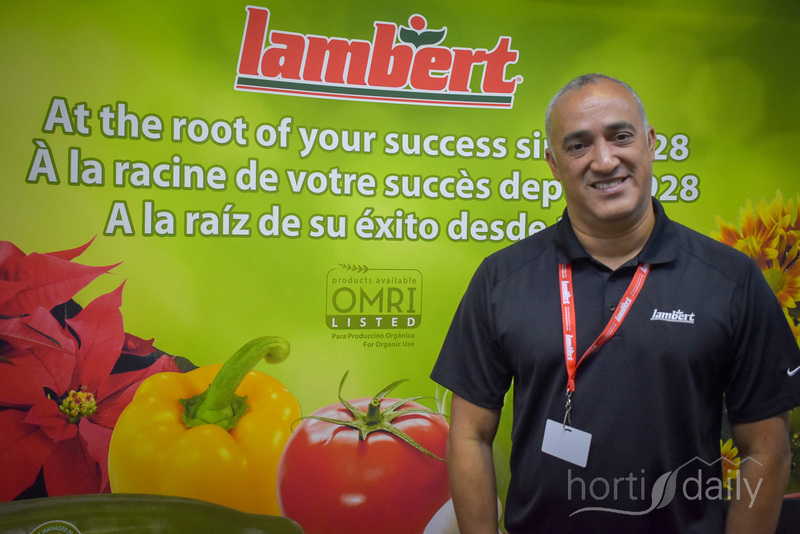 Optimising productivitiy and decreasing mistakes in the crop are arguments for growers to take automation into account. 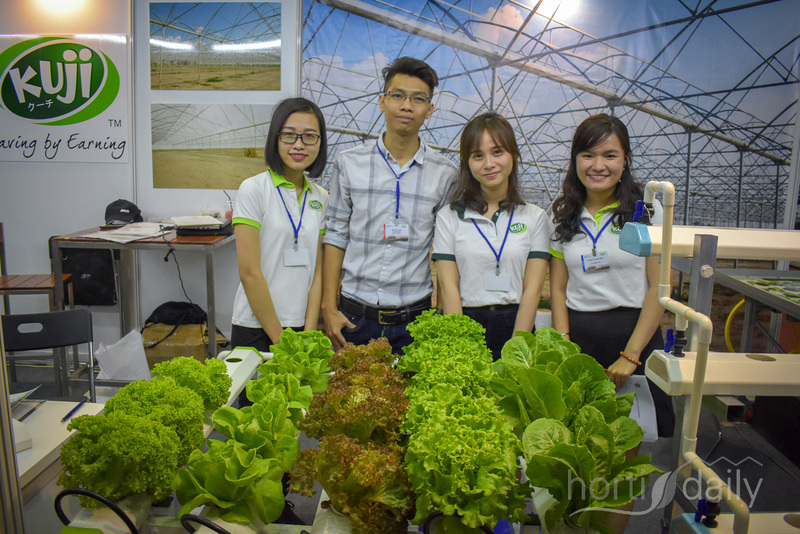 The Vietnamese academy of agricultural sciences showed their research projects. It's a wrap! 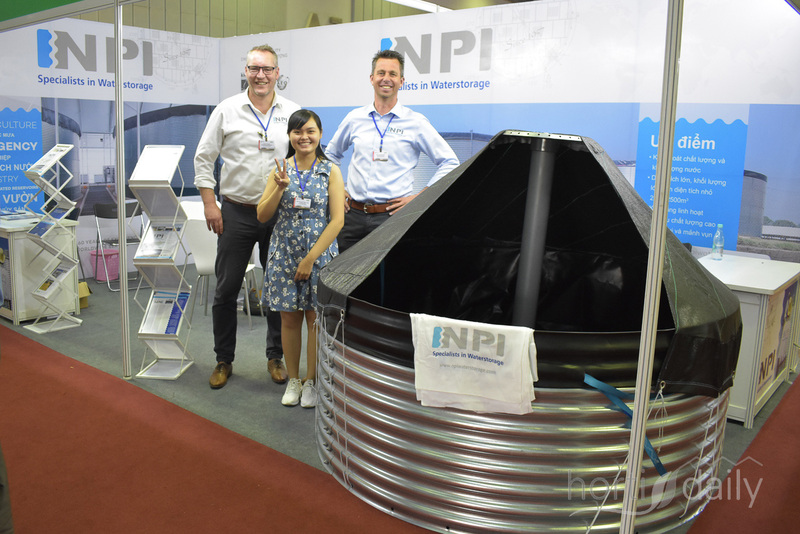 But not without this photo of Erik van Geest & Arjen van Dijk with NPI showed the capacity of their water storage tanks.